Had forgotten how sweet a trail Healy Creek can be, especially when one wants to avoid that brutal wind. -16 with brilliant sunshine for my ski. First part heading to the new bridge is a minefield of pine cones; intermittent cones from there to Brewster cut off. The part of the trail I enjoyed most was from Brewster cut off to Sundance Canyon trail where they have definitely made it clear not to go beyond. There is a Fuel Reduction ongoing construction project happening. Nothing but delightful skier tracks and powder to enjoy, likely perfected by the Banff skiers who frequent Healy trail. Wanting to re-con Brewster Creek, I went up it a few kms. Snowmobile had been just up, likely to bring supplies for the w/e, but keeps to left side. Right side has some shallow track, and between the snowmobile and skier tracks, there are varying amounts of powder. This was referenced by a previous poster, who suggested descending Brewster Creek from Sundance Lodge likely requires some serious “head’s up”. There was hardly any wind on the trail. Saw one mule deer and two tiny voles, but did keep checking behind me in case the Banff cougar was in that vicinity. Skogan Pass, 28 Feb, 2019: Jumped at an opportunity to ski Skogan Pass this morning. Started at the K-Village and followed Bob directions across Hidden from Ribbon Creek. The snow warmed quickly and VR40 wasn’t working so added VR45, above the “Screamer”. This worked well aided by staying in the shade. Soon down to a mid-layer as the sun warmed the hill side. Wednesday morning trackset held up very well to the traffic. We ran out of time and turned around the Skogan Loop in a CCW direction. This reminded me why I seldom ski this trail. The ski down, with all layers back on, super cooled fingers and toes. The “Screamer” was very manageable today. Toured down Ruthie’s trail and around on Hay Meadow for the first time. Very beautiful along the river. Another application of VR45 was required to climb out of Hay Meadow and back to K-Village. Another great day following Bob who follows the groomers. A beautiful day at Mt Shark with the temperature floating just below 0. Did the Watridge Lake trail to the end of Spray and back again. Trail is in great shape the whole way. Just as we were leaving, the grooming machine started into the trail system, so something will be groomed, but as of me writing this, the Live Grooming Report isn’t reflecting it. WBC: Brilliant weather and great skiing! We had been planning on Elbow-Iron Springs, but we changed our mind after talking to Groomer Bill at the trailhead, who had just finished tracksetting Moose Loop and both Mountain Views etc. MV West was in the best condition ever- pristine tracks and excellent coverage throughout, even on the fast hills on both sides of the highpoint. Good call, Bill! Good to see you at WBC today, Steve and Jo (and Piper). Perfect ski temperatures, and great snow quality. What a great way to close out an otherwise chilly February! Just a reminder that the Alberta Youth XC ski championships are happening at WBC this weekend. The kids will be racing on the Chickadee Loops, West Crystal and Crystal Links. Thu feb 28: bill Milne (from wedge pond). -9 to start at 1030. Silky in the morning heading north and over to Hwy 40 crossing and north through the treed section. Also went up the ice flow route, but turned around and headed back at the gap near the north end (where others crossed). 90% ice pole plants along the normal route but just enough snow. Only a few hollow sounding spots. Snow stayed cold on return in the afternoon even in the sun while I was down to a single layer, sleeves rolled up and no hat/gloves. That was a treat! Had a campfire cookout at wedge then continued to the bridge on Evan Thomas creek. That section was a bit more beaten up but not overused and decent enough for an unexpected add on at the end of the day. Sandy McNabb from Park Head Quarters. I skied nearly all of the cross country trails on the north side of the highway today. Everything had been groomed except for the Balsam Link which turned out to be way more exciting than what I had in mind. Snow conditions are good. Sadly much of the grooming was damaged by only a few walkers (usually only a pair of tracks). The grooming and tracks are “soft” so when anyone walks on them they are often punching through right to the ground. One of the downhills was messed up enough that it was quite dangerous. Perhaps there should be a fine for people going where they are not supposed to go. You can get a ticket for having a dog off leash in most areas, having a dog on a trail in some areas or hiking in too small a group in some areas. If there was say a hundred or two hundred dollar fine for walking / snow shoeing on a designated skiing only trail perhaps it would not happen so often or at least then these entitled individuals would be contributing in a substantial way to the maintenance of groomed trails. Sadly I did not actually encounter these people. Wednesday the 27 I encountered two hikers on the trail. They were taking a brake at the bottom of the hill on the Pine Ridge Loop below the Balsam link and above pine ridge connector. One of them was standing in the middle of the trail with his back to me. I was going quite fast and had to stop quickly because this guy had no clue. I managed to slow down enough then come to a crashing stop. No one got hurt but one of my poles ended up slightly bent. I hope they realiz now that the ski trails are for skiers. I was planning on getting new poles anyway just sooner then later now. Wow that sounds bad. Did you have any kind of conversation with them? That was the likely the tracks that I was looking at yesterday. Boy, they sure did make a mess. They should at least have been purchasing new poles for you. Nice day, some sun and -3oC at start (1 pm) and finish. Swix purple. The 1 km diversion around the ice flow was not great so we took the normal trail on the return. Was better. Just had to remove skis to cross a bit of water near the end. Just tossed them across and used the available log. Tracksetting was fine especially after the open area. No other folks on the trail all afternoon. 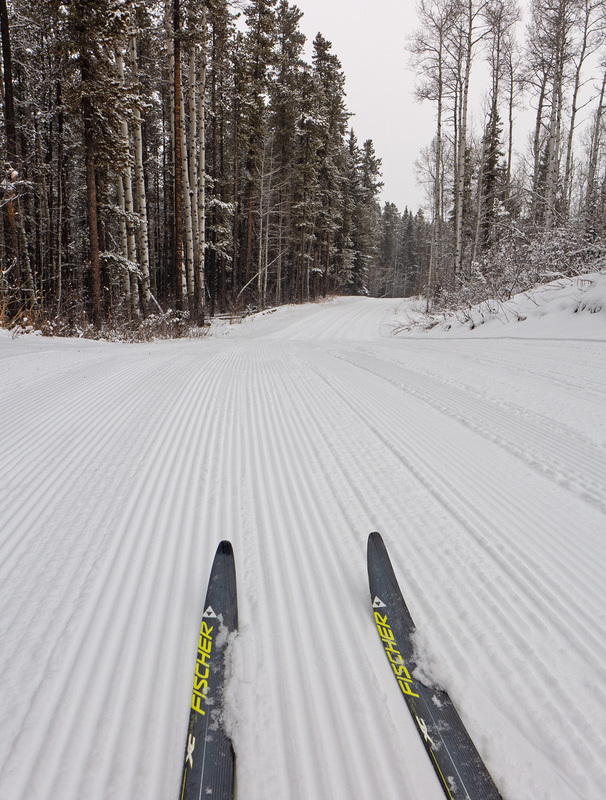 CNC BANFF LOOP – Just had a few hours today so we skiied the freshly groomed Banff trail. The snow conditions were excellent and the tracks not icy yet!! Peter Lougheed Provincial Park – started at Boulton Creek Parking Lot – up Packers to Pocaterra – south to Lookout- climbed to the top, turned around, and sped downhill on fresh grooming- YAHOO! Returned to Whiskey Jack and very fast downhill trip to Boulton Creek Campground Parking. Started -12C, ended -4C. All is beautifully track set with superb snow. Thank you groomers! Very few people taking advantage of perfect temperatures! Spray River to the high point above the 2nd bridge. After a whole month of cold skiing, today was not too bad! -13 to -7. We skied on the west side, out about 10 kms. and on our return, tested out about a half km on the east side before heading back. Tracks everywhere are pretty good, wobbly on the faster downhills, and no one has been walking on them! Signage seems to be working well. Looks like a cold start to March. Stay warm everyone! Priddis Greens Golf Course: Although everywhere is awesome right now, this little gem was pleasant diversion this morning if your looking for typical meandering old school classic tracksetting -3 connecting loops totalling 9km rolled & pressed in. Close by S. yyc for after work jaunt and of course, “naturally” quiet. Perhaps Bob can add the info he has on file from his 2018 post to MAPS tab above. Happy skiing. I’ve added the Priddis xc trails to the MAPS menu. RIBBON CREEK TRAILS – Skied up and down Coal Mine Trail, then to Ribbon Creek trail, down Kovach and around to Terrace and down to Parking lot. All trails in excellent condition including coming down Coal Mine and the big descent back to Ribbon Creek. Another perfect sunny ski day! Feb 27 Banff – Goat Creek Trailhead return via Spray West & Goat Creek trails. -23C at 0930, -6C high near Goat Creek trailhead, -10C back at Banff. Tracks are still in good shape, glide was poor for the first couple of hours until the weather warmed up. Wed feb 27: east elk/west elk. -26 in the lot at 9, -5 on return @ 5. Calm winds. The day warmed up pretty quick. Elk pass tracks in decent shape. Old wolf pack tracks going down tyrwitt. Mostly ankle to boot top trail breaking and the occasional knee deep bits going off trail up to east elk pass (AT gear), following a cougar who had walked in my old track, which made it easy to spot. Bad pole plants through most of it. Back to couch HQ at west elk. Snowshoers had scampered the nice skier set track. Surprised to see another party show up on a week day, but it was one of those good couch days eh. Then cheeky and Simona swung by to make it a party of 7 briefly. All 7 went back via blueberry meadows so that track is in good shape. Freshly groomed along elk pass trail from hydroline intersection north back to the lot. Time for something completely different. Mountain views, wildlife… what more do you want? Started at minus 8, ended at minus 2… skiing in warm sunshine all the time. Mtn Rd – Mtn View – W Crystal Line – Sundog – Loggers – W Crystal Line – Mtn View – Mtn Rd to the parking lot. Shad summed it up – HAPPY HAPPY he said – indeed !!! Nakiska to Hidden / Coal Mine / Kovach / Aspen. Snow conditions were quite good. We started just after noon so it had warmed up to -10 and it warmed up a bit more after that. The grooming on the north side of Ribbon Creek is more recent than that on the south side. Redearth Warden’s Cabin with a girlfriend. Started in -18 (VR 40 sufficed all day) and it warmed to -10. That trail can keep the cold contained in it. Snowmobile had gone up on left side earlier than we got there and never saw groomer all day-likely staff working at Shadow Lake Lodge. Saw one couple on our descent. Snow-plowing down was a bit tricky with residual powder snow in middle and snowmobile track on outside. Tracks holding up incredibly well all the way to SLL cut-off, considering last done Feb 16th. Pick the option of the new higher bridge at detour part just before Campground as other trail is on frozen ice. Great conditions at Sandy Mcnabb. We skied the trail beside the road, then Long Prairie Loop, some of Pine Ridge Loop (not over the top), Macabee Loop and some more of Pine Ridge loop. The trails south of the road have not been groomed recently but are still skiable; however, the trails north of the road are much better and have amazingly good tracks. Balsam Link is not groomed. -8 to begin so we started on blue wax, but it warmed up and we put on some purple wax. It was more like -2 to finish. Highly recommended. Thank you snowshoers for walking beside the tracks and not in them. This is an improvement. Just following up on GMJ’s report… conditions were indeed great at Sandy McNabb. We did a similar Long Prairie-Pine Ridge-Macabee Loop on the north side and returned via Loggers and Meadow Loops on the south side. Fresh grooming on the north side trails and a few cm of new snow on the older grooming on the south side trails. It’s a rare thing to have plenty of snow, recent grooming, clear skies and mild temperatures at the Sandy McNabb trails. Savour it, while it lasts! We skied Moose loop-Mountainview etc. at WBC, late in the afternoon on Tuesday. Tracks on Moose in particular could use a refresh as they are a bit wobbly in spots. But I’m not complaining- the skiing was very good! It was most pleasant out there at minus 11, and a bonus was finishing up at 5:45 with the sun still shining. sunny day ski ,tracks are holding up well ,some debris in trail , cleaned all twigs and cones out of tracks for a smoother ski out . -13 start -8 finish.well worth the drive. Feb 26th Maple Ridge Golf course. Newly groomed, and (mostly) track set today, for skating and classic skiing. Lake Louise: -23C at 10:00 am / -12C at 3:00 pm; Clear blue skies all day; VR30 worked well with better glide in the pm. Skied Townsite Trail out and back to Pipestone Loops. Snow cover on pedestrian overpass deck is very thin. No recent snow or grooming on the trails skied (Pipestone, Drummond, Merlin and Hector) but tracks are holding very well against skier and dog traffic. There is only a minor amount of tree debris on the trails. Snow bombs are beginning to appear but not a lot considering the tightness of the trees to trails. Visited MaSid’s couches on the Pipestone River (looking good) and spent a lovely 10 minutes in the sun until the breeze picked up. Such a beautiful ski venue especially returning south through the meadows with stunning views of Mount Temple and neighbors. Great day! 9 Meanderthals braved the -18 to start and had the BEST of conditions on the most direct route (out and back to the Pass). Saw sheep on the back of Pigeon and sad to have taken binoculars out of my pack. 3 on steel edge Rossignols, 2 on Asnes and 4 on skinny skis. Snow was slow but we ran into Groomer Alex (who I have not met previously) on our way past the High Level upper junction. Got perfect corduroy and even a single track for upper Skogan all the way to the Pass. Thank you from all of us Alex!!! It was VERY tempting, even for me, not to do the Loop on our return, as Alex had just headed up there to perfect his craft. Warmed to -10 for our 718 M. descent in just under an hour, although my thumbs stayed cold (NOT due to a pricey beer in the Lodge) until we all finished our lunch in the Lodge. Enjoy these pristine conditions while they last. Saw some very large paw prints up there. Sandy McNabb – NORTH Trails. I’ll eat my words from the last post and say that I was very pleasantly and thankfully surprised at conditions. Best ever. Well done Kyle. Use big baskets but skinny skis are fine. Have your wits about you on westward decent on Balsam (doable if can tele turn in powder, otherwise, not for novice). Flowy single-track bliss -like FoxCr-Boulton but for 20k …meadows to sun bathe …you get the picture. Go Soon! Two part ski today: 1) Elkwood parking 10:15am and -19C. Skied Wheeler to base of Packers, returned via Amos. Wheeler is great – clean, good tracks. Amos has a decent older trackset, but with a fair bit of needles. 2) Pocaterra parking (noon, -15C). After lunch in the warm confines of Pocaterra Hut (we had the whole place to ourselves), we skied the Pocaterra trail south for 5km, and returned the same way. Excellent tracks, a few needles (rarely bothersome). -11C at the end. Brilliant blue skies all day. Quiet early, several other skiers in the pm. Great skiing at Peter Lougheed today, if a bit on the cool side. Skied Pocaterra and Tyrwhitt to Elk Pass and return. Tracks are in very good condition. No crowds today. Started at castle lookout, went west until the reroute crosses the road and came back. Was heading to Louise initially given the forecasts but bluebird west of banff so stopped at castle junction for some flat trail ankle workout in good sun exposure. A chilly -20 to start at 1130. -12 on return at 3, but felt a lot colder with the east wind in the face on the return leg, and along the “hallway”. Walked down the road from castle lookout to start on the south side so no idea on the hill, although I’m sure it’s packed hard. A bit of needle debri in the trees as usual but minor. Clean after that. Good quality tracks still until you get to the reroute area. A bit twiggy and a gappy snow surface, plus the driveway crossings and CP traffic. Stopped just east of the railroad portion at an old culvert beside the trail, like many others have, for some sheltered sun. Huge flock of little birds along the tracks (eating grain maybe?). Could only hear them when I wasn’t skiing due to noisy tracks. On return got passed by a couple of trains while skiing close to the track. All I could think of at the time was the odds of derailment, being so close, and after the field incident. It was only brief. Only saw two other people. They had checked out east of castle lookout and said bad trackset. The cold must be keeping people away, but these conditions should not be missed! So cooler than the previous day for the Cookie Race. Good snow base and with the long range forecast showing cold temps into March, should make for a great upcoming month on the whole trail system. Thank you to the groomers for the fantastic job laying down those tracks! Encouraged by Skier Bob’s earlier post on Sandy McNabb (as well as other skiers’ posts here), I headed southwest and skied Sandy McNabb for the first time. I did the Sandy McNabb loop, Loggers Loop and most of the Meadow Loop. Conditions were really good; virtually no hazards to speak of other than the odd twig of brush poking through on the track. Lots of soft snow with nice skier tracks on top of the track setting that was done on Friday. I had good glide on green VR20. The trails I skied are quite flat so this would be a nice spot for a relative beginner or someone wanting to avoid hills. It was also very quiet. I encountered only two other groups of skiers for my entire 2 hour tour. I’ll definitely be back here. Thanks again to those who shared their Sandy McNabb trip reports. In order to get nice views of the front range mountains at Sandy McNabb, one must step off the groomed ski trails. An easy spot to do so is near the western-most intersection of Long Prairie Loop. There you can use the Death Valley ‘Loop’ snowshoe path to gain access to that clear knoll just on your left. If conditions permit, the multi-use Long Prairie Ridge is a must – it has the best views in the entire trail system. If coverage is sketchy we tend to visit just the north end of the ridge using the N-S 0.4km segment. Big Thanks must go to Chuck; his report with stunning photos – as usual – from 2 (3?) years ago made us aware of all this. Not my photos… never been there! I think it was either Alf Skrastins or myself who’s photos you likely viewed Cheeky. I did take a picture of the front ranges from a spot above Long Prairie, East of the Death Valley junction. CASCADE TO BRIDGE -Nice sunny but very cold day. We changed our initial trip plans for a shorter ski close to home. Track was just groomed. The snow was slow but otherwise excellent condition; still a wonderful chance to get out skiing again! Just skate skied at Confederation this morning. It’s cold, but get out there! Snow is great, and this is the best grooming that I have seen on the golf course – for both skate and classic. Thank you very much for the fabulous job groomers. Education Confrontation: We skied Sandy McNabb today because, well, it was so much fun yesterday. Wish I could say the same for today. We decided to ski Logger’s Loop area as I have a bum knee and have lost a bit of confidence so decided to avoid some hills. When we started out, my husband pointed out, rather sadly, the destroyed track setting due to, in this case, snowshoeing. Not much further along the trail, we came across a group of five snowshoeing on one side of the double tracked trail. This is important and will be addressed further in my rant. My husband, in a non-confrontational manner, said that the trails on this side were for x-country and that snowshoeing, x-country skiing, and multiuse trails etc., were on the other side. Conveniently, we were standing right beside a trail map. This group were all in their 60’s so at this point, to call them childish, would be an insult to children everywhere. One male with a long white beard became very agitated and said “this is k-country and I can do what I want.” HUH?? My husband asked him to come over to the sign and he would show him that this was not quite correct. The bearded “gentleman” looked at the map and from this point on I was in disbelief. Not sure if he has a mental condition or just does not like being in the wrong but his next reaction was to start stomping in his snowshoes all over any track setting that was still in decent condition. The only thing that warmed my heart was that his stomping caused him to lose his balance and he fell over. Male number two went grunting by me (an innocent bystander at this point) and dropped the F-bomb in my direction. The lone female of the group went all menopausal and started screaming something unintelligible but directed at us none the less. Enter male number three. In all his wisdom he said…wait for it…that they were only walking through one set of tracks and we had the other side to ski in. Now the kicker. My husband has known and is/was a friend of male number 4 in the group. Of course, I cannot mention his name, but if Tony is at our local coffee shop tomorrow, my first question will be “WHAT THE HELL?” My rant is over but I do have a couple of questions for this group. As a skiing community, we are encouraged to inform individuals who DO NOT READ SIGNS, that, in future, could they stay on the trails that allow the sport they are pursuing. But if situations like this arise, would anyone blame us if we kept our eyes to the ground and skied past them? Is it really necessary for us, in future, to double up on blood pressure medications so we can survive encounters like the above? I am still in disbelief after seeing a grown man stomp on track set trails because he feels it is his right. If I could get all their names, and I can, would it do any good? I am a little bummed about more than my knee right now. Can I, or should I, pursue this? Or is ranting my only outlet? Can I get the death penalty legalized in Canada. I have a lot to think about tonight. Community service maybe? Sweeping the parking lot come spring might be enough to convince him that it takes lots of work to keep WBC amazing. Snowshoed snowshoe hare yesterday, so much fluff to play in. What’s the status of dog sledding at WBC, saw some guy heading up Hostel Loop with a pack. Lame is a good word. This happened at Sandy McNabb, actually. I think giving them a ride on the grooming/track setting equipment in -20 weather to show them how much time and work goes into looking after these trails would also be adequate. It would also give them an idea of which trails they should and should not be on. It would also give them much needed info as to what double tracking means. Today is a new day. We are headed back to Sandy. Looking forward to an uneventful trip. What follows in no way constitutes professional opinion on any of the parties involved and should only provide professional comment upon dynamics associated with such instances as shared above. There is a social-psychological basis for such behaviour. Humans live within a self-created/established cocoon of convention; a domain within which they feel or demonstrate efficacy, agency, and control. Not only providing a sense of personal authority, this domain also provides a sense of protection. For some humans. this is more restricted and even fragile and when events, or decisions, lead them to step out of, or find themselves, beyond its predictability and structure, well, they can become goofy. Outside, in nature or away from the familiar landmarks associated with one’s more usual sense/definition of things -one’s reality- is more threatening to some than others. Also if you have led a life where you can speak to others in your cocoon of convention. like your co-workers, wife, husband or children, as Sheila describes, it is more easy to do so when in a ‘dis-oriented’ state. So Buddy gets out in nature, is unsure of who or what he is about finds his definition of reality not in co-ordination with the actual reality and throws tantrum/fills his pants , all in service to self-efficacy, impression management, and personal authority.The less you think you have any social cred, respect or authority, the more quickly you express it or grab it when you have the chance! We use a term when encountering it in skiing…FOGs and i will leave the translation to others. Haha, I will spend the rest of the day coming up with all kinds of possibilities for the acronym. It will be therapeutic! Also, thanks for your insight. Human behavior is fascinating. Peter: re dog sledding – my understanding is telephone loop (which I think leads to hostel loop?) is multi use over the winter, making dogsledding a-ok. Mountain road would fall under the same category. I think I’ve seen that fellow before – beautiful team! It almost doesn’t sound real. Crazy off leash snowshoers. What a terrible experience. Ruining tax payer funded infrastructure is usually out of ignorance (which is not an acceptable excuse, but educatable) or wilful. Sounds like they knew exactly what they were doing and were going to just do it anyway. I assume that such consideration comes with accepting the consequences of wrongdoing. I struggle with this issue lots, not wanting to be the righteous mall cop. But I would also prefer to be on the side of resolving the issue rather than contributing to it by doing nothing. The hut goers I ran into who dumped their food at elk pass presented this quandary. Their willful dismissal of the issue for their own personal benefit and their attitude made it easier, especially when the harm was the potential loss of a protected animal. I recently ran into a fellow skiing with his dog on elk pass. I did my bit to inform him, potential fines etc, and did so nicely. His “surprise” seemed feigned so I figured he knew full well what he was doing. Especially as he was there at 8am, sneaking in a quick ski with the dog. But he was nice about it. So no biggie. I did my bit and maybe he won’t do it again and there was no significant harm. The bombastic nature of the group you ran into would tip the scale for me. But, they also know who you are and maybe there would be retaliation. Nobody needs that. But I also wouldn’t stop trying to educate users and making it better for everyone. Thanks for sharing. I could give them the benefit of the doubt up until Buddy the bearded man realized the map proved my husband right and he deliberately started stomping on the tracks. That is when it got weird. However, there was one occasion years ago when a couple were snowshoeing in the wrong place, again at Sandy. When we pointed this out they were so apologetic and concerned about what they had done they started trying to go through the bush to avoid the trail completely. In this case, we felt bad to have even mentioned it to them and begged them to come out of the bush and walk on the trail! I guess it is a crap shoot but when it is 5 against two and you are in your 60’s and you have a bum knee and you have never had a physical confrontation in your life, it is a little scary. As always Sheila, such a colourful account that unfortunately, I’m all too familiar with out at Sandy McNabb & Bluerock PRA’s. I’ve been skiing (and in summer, hiking) out there for many years and -sadly, have all but given up on the area in winter due to lack of respect among (more than some) users and Park’s disinterest in trail management there. How frustrating! I hope you are feeling better by now. That man could be in the early stage of dementia, or to get all ‘Dr Phil’ on you, he could have a short fuse, and is taking his frustrations out on everyone and everything else. Hence the others in the group supported him, in order not to be the recipients of his rage. Nevertheless, take comfort in knowing that you have a happier life than him! Sorry your ski trip was ruined though. I don’t think you could have handled it any differently. I don’t know how to explain it, but I have had a sensation skiing there that there was a deliberate intention to ruin the tracks. And I too have experienced, the f-bomb I can do whatever I want in my face young punk feedback on my request to stop pulling down trees and pilling them over a creek, type human. Fresh snow fell overnight over the groomed trails, ~3cm. Big thanks to the organizers and volunteers for creating such a great event! I’m guessing every racer had his/her unique waxing receipe. Swix LF4 -10..-32C glide and Rode Green -7..-15C worked well for me. Thanks to our Banff Park Tracksetter who always hits the trail after it snows, even if it is his day off. It appears snow likes to fall on Friday night here! Conditions were excellent… the best of the year so far. Nice to see no damage to set tracks by any multi users all day. Finally an opportunity to ski with my former neighbour from Lac Des Arcs and our mission was an easy ski from Wedge parking (-14) doing the Connector and Fireroad and Bill Milne to the detour. Delightful when sun came out; only wind we encountered was just north of the Golf Course where my Liberty of London silk scarf was flapping in the tree. Great spot to hang it George and delighted to reunite with it!! Cookies by Helen are baked and ready in freezer to give you. -12 on our return on this very relaxed 15 kms. ski. I am glad that you were able to retrieve it. Weather was chilly today (-16° at the start) but there were plenty of cars in the parking lot at 10:00am, and ski lessons seemed to be in full swing when we arrived. Using V20 and V30 wax, we headed out on the south trails, Logger’s and Sundog loops and East Crystal Line, and met the track-setter busily on the job. Although the tracks were a bit soft, as they didn’t have time to set up, they held up enough for us to have a great ski. After lunch we ventured north onto Moose Loop where again the conditions were very good. While the parking lot area was very busy, the longer trails were not, and we met relatively few people all day. Skiing at West Bragg Creek look like it will be good for at least another week. Cascade Fire Road – We started at -13 and finished at -11, so temp did not change much over the day. There was another 1-2 cms of fresh snow in the tracks, to add to the few cms. from past few days. We were first ones out on the trail again and didn’t see anyone else until we were about 3 kms. return from the cabin. Tracks were a bit slow with the fresh snow and were wide and wobbly, especially on the long hill back down to the road at the finish. Disappointing to come down that hill a full minute slower than our best time, and be thrown back and forth in the wavering tracks at high speed. All in all, a good day, mostly sunny, with a nasty little wind in our faces all the way back. Is there any current info for Shaganappi Golf Course? The most recent Trail Report on their website is from January. Shaganappi was trackset on Feb 21. 7K is trackset and 2K is groomed for skating. It will have a bit of fresh snow from last night. BREWSTER CREEK TO SUNDANCE LODGE – we skied up in our classic skiis yesterday. Conditions were good but the snowmobile track bulge next to the skiier track made it tricky to ski down in some spots. Would be better to have taken our metal edge skiis for that. If conditions were icy and the snow more solid, could be hazardous. Anyone know if Goat creek or Cascade have been groomed since the most recent snowfall? trail so fast. VR40 was almost perfect for grip. Skating looked a bit harder. Over 5cm fresh in the middle lane, but people will pack that down this weekend. My note was only about Cascade fire road. I hadn’t noticed you also asked about Goat Cr. Of that I have no idea. Excellent ski out to Bryant Creek/ Warden’s cabin. Used my skinnies today for extra work out. The fat mountain skis have been out in force! The groomers do a simply fantastic job in keeping the trails in ski order. Kudos to you all. Tim sped by seven of us, both coming and going from Bryant Cabin. Started in -15 and 7 hrs later was too tired to check temp but likely -9. Cabin felt warm at lunch from two who had been staying there for a couple of nights. Watridge Trail always feels like a longer ski out, but my one coat of VR 40 held up well on all those 28 kms. You are one strong skier Tim! Well, thanks Helen for the kind words. Does not always feel that way. More of a runner, but living in Canmore helps with the mindset for sure. It was a lovely ski, been wanting to do it all winter. Say hi to Breakaway Sue please. WBC: Another great ski day at WBC! Decided to go the opposite way most people were going. Good decision=hardly saw anyone., it was so pretty and sunny and quiet. We skied Sundog, Iron Springs, Elbow then back on Sundog. Impossible to get lost, there’s signage everywhere. Can’t wait to go back on another warm day. Thank you groomers. Another stellar day at West Bragg. Out Mtn. Rd to Mtn Rd West (so nice with wide open blue sky and great snow and track) joined Moose Loop stayed north around to a great bypass of the Telephone Loop Ice Flow. Jct. Saw the fat tired motor cycle groomer and chatted with Groomer Dave. Quite the machine indeed. but a duo of big fluffy English Sheep dogs had every one smiling. It was one big smile day for every one out there !!!!!!!! Telephone loop/moose loop/loggers loop/connector to iron springs and east crystal. -10 @ 10 to start, -3 on return at 430. East side of telephone was shallow inconsistent tracks, slowly improving going north. A large rock poking out on the uphill just north of the northernmost ice flow, just below the crest. The NE corner of the loop was rough from the groomer struggling up the steeper bits of the rolling hill section with a traction rut down the middle. Made for some creative snow plowing. Should be better after this next storm? True north side and west side of loop had good smooth tracks and grooming which made for nice cruising back in the sun. Took the off-trail route along the edge of the meadow on the north side of moose loop, following an old skier set track for fun in the sun. Nice parallel diversion. Boot top in the recent snow filling the track. Rest of moose and the return through the central groomed trails were all excellent, especially the late afternoon sun on loggers. And I’m loving the new picnic tables in sunny locations. A great addition for a couch surfing junky. I too found the NE corner of the Loop (from the Disconnect to the Long Distance junctions) to be very rough. I suspect this was caused by the fat tired motor cycle that they used to groom the above cycle trails. As I snowplow down the numerous steep hills I found the ruts and some bare patches left by the cycle groomer to be very treacherous. Otherwise the rest of the Loop is in very good condition especially the North and West sides. Very good conditions at West Bragg today, and beautiful weather. I did Hostel first (which could use regrooming, as someone walked all over the east half and the west half has a lot of tree bombs), then Mountain Road, Moose Loop, Loggers and West Sundog, all of which were excellent. The ice flow at the Moose-West Telephone junction is amazing. Purple wax day, as long as it wasn’t on too thick. Fat bike groomers were out on their machines. Fat bike groomer: is that the motorbike with a fat rear tire, chains and a 1 foot wide grooming plate? Saw it parked on moose loop. Had no idea what it was as surely it was inefficient to groom moose loop with. (-: Creative solution for the bike trails! Sounds like a great day at WBC. I was backcountry skiing at Amiskwi Lodge for the past week, so I missed the biggest snowfalls of the season at WBC. Welcome back, Alf! When we didn’t hear from you for a week, I figured you were off skiing in the backscountry. We’ve had many great days at WBC and with the cold temperatures, it looks like many more to come. Timing was everything, for fresh tracksetting, but not for lunch in the Lodge! With no weather inversion up there today, we were really looking forward to that wild mushroom soup that Helen told us about… but weekends means Saturday and Sunday only, between 12 and 2 pm. Only regret is not putting a bid on Hillary Smith’s offering (maybe we could still use the second night)! WBC: Just a quick jaunt around core trails early this am. In 1 hr the temp climbed considerably & pole plants were noticeably softening in concert. By 10am the parking lot was filling up and a few adult lesson groups were also starting out. Reminder: do enjoy this reprieve in weather but please pay your dues in the drop box … and slow down! along the WBC approach road. Skied from Elbow Falls to Little Elbow campground. There was about 3 inches of new snow. I broke trail through an old footpath, and in the Powderface area there was an old snowed-in snowmobile track. Else it’s about a foot of powder and facets with no base. Observed some whumpfing in places. Usually this area is wind-blasted down to bare pavement with bits of icy, crusty snow, but not today: conditions were great. Glorious sunshine today and great views. Been wondering about that stretch of road, thanks for reporting Arie! South Glenmore was groomed today! And trackset. Only a few footprints on the trail. Thu feb 21: sandy mcnabb. About -15/17 at 11, -10 at 430. 4-6 inches in the unplowed lot on the north side of the road closure. Cheeky and Simona took me on a tour of the area, new to me on skis, and a very nice day to do so. Started with a tour up to the west end of long prairie ridge and SE along the ridge back to the groomed trails. Nice gentle gliding in the fresh snow over top of the prior days grooming. Old snow shoe and animal tracks along the ridge crest were followed with decent fresh snow coverage. A bit challenging on the east end descent. The snow shoers behind us did not walk in our tracks and headed into Death Valley. We crossed the road to the south side and hopped on loggers loop (cw). At the east end we ventured down an ungroomed side trail to the grassy bench above the river and skied that both east and west on an older skier set track. A bit of log hopping along the off trail route but not too bad, no rocks really anyway. Completed loggers after that, still breaking trail in fresh snow over the grooming. No real hazards on the smooth track base covered by about 3 inches of fresh. Back to the car on meadow loop. All the groomed stuff is in very decent shape with yesterday’s fresh snow. Might shrink quickly though. Ended the trip with a fire and sausages in the day use area for an excellent day exploring in the strong sun. Anyone know what was the most recent grooming on Cascade fire road? Skied it today. Don’t know when it was last groomed but it’s in great shape; double tracks with skating lane as far as the first bridge, single track beyond. Tracks in good condition, no signs of walkers or miscreant moose on the trail. The Cascade Valley was groomed and trackset Tuesday morning. Thursday the tracks were covered with 2 cm fluffy snow. Skied up to Sundance Lodge today from the Healy Creek parking lot and enjoyed a lovely lunch in the sun on the front porch. There is a pretty good skier track on top of the original trackset for most of the way. The snowmobile traffic can create quite a ridge in the center of the trail, but fortunately, the cold temperatures and fresh soft snow made for a easy controlled descent. If it gets warm and then freezes up, watch out as it could quickly become a rough trail. Banff Springs to Goat Creek parking up and back. I did a long one today… The tracks are a bit worn down but the snow conditions are really good. The last couple of km skiing up to Goat Creek was not as bad as I had imagined that it would be. Snow shoe users seem to be pretty much keeping off the track. At the other end I encountered 3 wanna be ice climbers (they had been unable to find where ever it was they wanted to climb) messing up the middle of the trail on the skier only part. I was not very polite. The descent to the Goat Creek bridge is not icy but the trail has not been groomed in a while so the packed part in the middle is kind of narrow. I have big skis (210 cm) so it was a challenge to keep under control. Fortunately I have metal edges. Helen… Your scarf fortunately is pretty close to the road access into the golf course so if you are heading up to Bryant you probably would only require 10 minutes or so to ski north and pick it off the bush. I saw your 1000 km picture. Wow that is a lot of skiing and the season is still on for a month or maybe two. I did ski by you on Sunday. I will pay more attention next time. Great day on Goat Creek, first one down after the snow so found I had to push on the down hills as well. Skier tracked but decent. The new snow was good in the technical sections for added control. Blue sky’s and warm temps made for a great day. There were lots of skiers behind me so tomorrows tracks should be faster. Did you love it Bob? What a day !! -13 C at 11 AM. Mt Kidd to Evan Thomas to Wedge Pond back to Mt Kidd.About 1cm of new snow on track set. Followed Linx tracks for 100 meters on Evan Thomas Trail. -8C to finish old LindeX green worked great. EMERALD LAKE AND KICKING HORSE TRAIL – lake /alluvial fan trail is currently skier tracked along the lake and in good condition. Wonderful sunny day yesterday. Kicking Horse trail groomed and in excellent condition too. Look for all of the “snow animals” along the trail! We finished off our mini cross-country ski holiday with a trip to Lake O’Hara today. The day was glorious as the sun shone on us as we skied across the lake. The tracks were from last week’s track setting and some were wind-swept, especially at the start of the trail. The conditions were fairly fast and fun on the downhill. It was an amazing way to end our trip! Started from Ribbon Ck parking at 10am to -11C and light flurries. We were the first skiers on the trail. Yesterday’s tracksetting was covered with a cm or so of fresh snow – we got good grip with VR40 wax. As we gained elevation, the fresh snow got deeper (2cm at High Level jct; 3cm at the top of Skogan Loop, and our skiing got slower as we broke trail (on the left side track – preparing for our return). Tiring going up – almost turned back a couple of times. But we made the top – reward time! Skiing back down was a blast, with good glide in our uphill tracks, and lots of control in the steep sections, where we never needed to snowplow. As noted on the grooming report, there are 3 ice flows on Lower Skogan (below Nakiska), so some fancy dancing is required there. -5C at the finish, and still flurrying lightly. It was nice meeting you for a few seconds as you were blasting down the hill. Thanks for setting the tracks for us to follow to the end of Skogan pass. We left the Stoney trailhead at 11:00 and went up Hay Meadow and Ruthie’s to avoid the ice flow. V20 with some V30 worked perfectly. On the way up we were motivated to make it to the top when we spotted you flying down under the powerline. At first glance you looked more like downhill skiers. The ride down was perfect. We followed in the unset uphill track to slow the descent and set track for the next group going up. We were in control with minimal snowplowing and made the 10.5 km 650 meter descent in less than one hour moving time. It started snowing heavily as we left the parking lot and had no problems on the drive back to Calgary. Ian and Darlene, it is nice seeing you get your two cents in. We hope to be back soon. A nice report by the way. Yes, Hay Meadow and Ruthies would have been a better choice. We also enjoy access via Hidden Trail / Nakiska ski base, but Hidden had too much fresh snow. Confederation. Went out this morning around 10:00am. With last night’s light snow, it was skier tracked over previous grooming. All the grassy bits showing thru yesterday were covered. With the wind, snow was drifting into the tracks in a few places. Another enjoyable in-town ski. Lots of people out again, probably 20 cars in the parking lot. I used the excuse of going to pick up my wife’s lost and then found Fitbit (thanks again to all the seekers and the finder) to get in a rare midweek ski at Ribbon Creek. Mild temperatures, lightly falling snow, trails to myself all day, perfect calm, lovely conditions – sometimes we take for granted that we live in a freaking postcard. Starting from Ribbon Creek went up Bill Milne to the Village, then Kovach and Aspen to Terrace and back to the start. Enough fresh snow that everything was freshened up, but not enough that it was much more work to move forward. Kovach and Aspen were in much better shape than I expected given the grooming neglect. Downhills were significantly slower than their best, but I was certainly in no hurry to be done so I didn’t mind. Just a great day in excellent conditions. A nice after work ski yesterday around the course. All the trails looked to have been groomed and track set in the last few days. Good coverage overall but still a couple of thin spots. Very enjoyable! Thanks, Ed the Groomer, for all the work at Strathmore! You can tell where it’s a bit blown and drifts have been knocked down, but given the unending cold and mediocre snowfall to date – it’s a great time to get out and ski! A little soft/variable here or there, but tons of fun all the same. 7 pm, -6, waxless – easy peasy. First time to ever ski Bragg creek. It was ace, nicely groomed and the volunteers are creating a diversion to go round the ice flow at the junction of telegraph and moose. So many people out, met Anne who gave us advice on ehere to ski. We did moose, mountain view, loggers, Crystal making about 20km. Different type of ski with many dogs and people out plus some horses! So nice to have snow and warmer weather, hope this holds up and does not go above zero yet…. Larch Hills Nordic, near Salmon Arm was our destination today. We skied some of the trails and it was okay but we were spoiled the last three days, skiing spectacular trails. We were somewhat disappointed as the cost was $15/person; there were no maps available, and the junctions were only periodically marked with maps. It was somewhat difficult to navigate but the snow was good. The grooming was sporadic. PIPESTONE TRAILS – Trails in excellent condition today…..some new snow falling too. Sunny Morning at WBC and Sylvia brought with her warm sunshine about then! Finished up a jaunt around Hostel Loop both ways and up to MtnRd summit to bask in the warm rays at about 11am. Suburb conditions all around; saw a big group out enjoying skiing and pealing off layers enroute. Was able to enjoy my lunch after clearing off the patio -which I may add needs to be bigger. Another idea for GBCTA thinkers & doers: how about a warming/social “hut-on-skids” at the MtnRd/West Mtn View summit …great vantage, good location/destination … could even be solar powered with all the clear aspect up there! I had a very enjoyable ski this afternoon. Lots of folks out even mid-afternoon. Tracks are holding up well. Only a few spots with a bit of grass showing thru. And the warm weather was a big bonus over last week’s skiing in the cold. Just finished Telephone loop at WBC. Pristine tracks on Hostel, hard packed trail (from walkers) to Snowshoe Hare then fast tracks for the remainder. Two giant ice flows to navigate around which was easy enough. All in all a great day to be out with sunny skies and warm temps. -13 @10 to start, -3 on return at 2. Upper terrace and kovak not groomed and track set yesterday. Same with upper bill Milne. A few thin spots starting to show up here and there. Trevor: no sign of the lost item. Lost and found contact at the village is the hotel front desk (4035917711). On a math note, learned this formula as a teenager: slower traffic keep right = keep right except to pass = if you arent passing someone, keep right; which does not equal “keep left except to be passed”. Ribbon Creek. Another lucky day. I was eyeing the trail report throughout the day for a little extra motivation. The area seemed due for some tracksetting. After I had decided to go, green trails began to appear on the map on the drive out, so I was smiling before I even started to ski. Really enjoyed the fresh tracks on Ribbon Creek and Link (ccw), they were so fun, and RC felt really controlled on the steep snake descent. Kovach and Aspen on skier set tracks are still in good shape. By day’s end it was getting cold and the skier tracks were faster than the firm new tracks on Terrace, which felt like soft sandpaper. My blue wax probably didn’t help – I applied it during the mid afternoon sunshine to get up to ribbon creek (I think the climb is the lower part of Coal Mine). The bit of fun on RC and Link and the sun beams were well worth the drive. Clear skies and lots of snow in the trees for maximum reflection provides a memorable ski. My wife lost a black Fitbit Alta on Terrace today on the way down from Kananaskis Village to the Ribbon Creek parking lot – probably on the hill somewhere. If anyone picked up you would be a hero. Great day of skiing in excellent conditions there and on Bill Milne otherwise. The brand new tracksetting on the way back to the car at Ribbon Creek was an extra treat. Hi Trevor, I skied down terrace to the parking lot around 5 pm but didn’t see it; speed and low light didn’t help. Hopefully it turns up to tomorrow, best wishes. Agree, it was a real treat to find some fresh tracks. Someone in our group found it yesterday and handed it in at the Village but not sure which desk. According to the desk staff, calling that one central desk number should be adequate. I wasn’t convinced at the time, but it is all one large corporation as I have learned. I guess we will see. Thank you! That’s great. I will call them and track it down. Skierbob strikes again! Baker – Castle return. The temperature at the Lake Louise Hostel was -24C when we got up and not much warmer by the time we checked out and parked at Baker Creek. But the sun was strong, the wind calm and scenery delightful. It didn’t take long before we were shedding our jackets! Most of this trail is in the sun, so we had a really pleasant day. No new track setting, but skier set tracks were good. We skied back to the east-most hill top and had lunch on a big log in the sunshine. It was -11C when we finished. Glide was wonderful, compared to yesterday, and nobody got frost-bite! Was thinking of WBC, but then thought everyone and their dog would be out there. So decided to give Shag a try. It was reasonably decent. Skier track set along with some packed trails. Not too busy to start but the parking lot was getting pretty full when I left at 3:30. Snow is still pretty cold so the glide was a bit grippy. Beautiful day in PLPP. Skied the Cookie race route. My friend Pat FOUND a GARMIN on Tyrwitt. It looked like a model used for a bike and had initials on it. I handed it into the Visitors Centre ( Discovery Centre). If it’s yours you can phone them or go and pick it up ( identify you initials.). We would love to hear that it gets back to its owner. Our fun continued at Sovereign Lake and Silver Star today (near Vernon, B.C.). The cost was half price due to it being Family Day! It was -12C or so with perfect snow conditions. We had another big, fantastic ski day! The snow conditions are spectacular! Well Bob, today was ‘Perfecterra’. I had a great ski starting at 10am this morning from Pocaterra parking lot along Pocaterra trail to Whiskey Jack, stopped for a chat with another solo skier then down Whiskey Jack, and along Wheeler etc back to the Pocaterra parking lot. My fav part was the Winter wonderland along the top of Pocaterra. Love seeing the snow hanging on off the trees. Blue sky and great conditions overall except Braille isn’t groomed but skiable. Today was the yearly visit to Wedge parking lot to ski the Connector loop. Crossed hwy 40 at Evan Thomas and continued along Bill Milne all way up to Kananaskis Lodge. The sight of the Ribbon Creek overflowing was pretty impressive and I do not recall such a big flow in my 20+ years skiing there. Looks like the staff or renters of the fat bikes enjoy that curvy 2.2 kms. downhill section from the hotel to Ribbon Parking lot. Warmed significantly from -18 start to -9. At the south end of the detour there is a minor wet section to try to get across without getting iced up. Lots of happy dogs and families enjoying Family Day. I lost a beige Liberty of London silk scarf if anyone finds it. I did not retrace the Wedge connector so it could be in there? Cookie reward! COOKIES BY GEORGE are in order!!! What a surprise to wake up to. Years ago, another school mum and I dressed up for a School Field Day as “Lost” and “Found”. We had all the contents of the bin pinned/attached to us in some fashion. It made for a terrific costume and reunited a lot of the school kids with their missing items. I’m glad mine was “Found” by a fellow skierbob fan. Thank you gh. Will do a re-course tomorrow. It would be great to meet up with you sometime. I thought that I did actually encounter you yesterday at around 1600 a little south of the big ice flow. Were you wearing the light blue jacket? Was truly hoping to check out the scarf two days ago when heading into Calgary, but baked cookies all morning instead!! Then got stranded overnight in Calgary when T-C closed right before Three Sisters exit. Yes, to periwinkle blue jacket/pink toque. Hoping to ski to Bryant Creek Warden Cabin tomorrow. Me ski Cookie Race course today. Me like blue sky and perfect tracks, but me see no cookies! Me go back again this Saturday for race, but this time WITH COOKIES! The Coolie Monster might share a few with race day skiers such as you! -25 @ 945 the start, -8 to end at 330. Warmed up pretty quick though. Mountain Rd/moose loop/mountain view west/mountain view/loggers/elbow/iron springs/east crystal line. The ice flow at telephone/moos junction was wet when I went by. Took the skis off and walked it. Be easy to walk in the wrong spot and ice up the boots. The ice flow at the west end of moose has good snow coverage and can be skied across with ease. A handful of thin/dirty spots throughout the big loop. Few enough that it’s easy to forget to look. Oops. Getting a bit thin on the south facing iron springs hill too. Careful descending the south side if going clock wise. North side was fine. Ran into bob at the iron springs table, and got to witness his infamy, then we shared a bit of trail together until the high point. A good day out. Only about 6-8 inches of snow off trail in the few places I checked. Maybe a foot in a couple of higher protected spots. Not enough for couch building. Sunday Feb 17th was a beautiful day in Banff. Sunny skies and temperatures in the mid (minus ) teens. Skied Spray west, Goat Creek to the first bridge and then back to Banff on Spray east. Excellent coverage everywhere and recent tracksetting. Even the link connecting the east and west trails over the bridge near the parking lot was skiable. WBC. East crystal, iron springs, north elbow, logger’s, mountain view, mountain road. My timing was just right – fresh, clean, untouched tracks on most of Iron Springs and Elbow. This rarely happens! Since the tracks had yet to consolidate and settle (as noted in the groomer report), they were a bit soft. Wonderful conditions throughout, especially if you venture off the beaten path, much improved since last weekend. Iron springs and elbow best done CW, based on tracks, unless they’ve been doubled. Thank you, trail crew for all that work in the last 24h! After reading on this website about the Yoho Challenge event (a fundraiser for Kicking Horse Ski Club) we went to Field today to check it out. Turned out to be a fantastic day! Started at -13C and wind from Visitor Centre, crossed the highway, great single track trail all the way to Emerald Lake, food station at the lake with wonderful treats and hot drinks. Sunny, warm, no wind and amazing scenery at the lake. Skied to end of lake, looped around the alluvial fan, then back on same track with a side trip to Natural Bridge and Emerald River. We had tired legs at the end. Thanks to Jessica and all the wonderful volunteers from Kicking Horse Ski Club for a really fun and low key event!! I’m looking for some intel on Telephone Loop at WBC. From the map it looks like it was last groomed Feb 13. Given the snow we’ve had, I’m wondering if it’s a slog and slow to ski right now or is it in really good condition which could be the case as well. I’d rather ski one longer loop and add a few smaller ones than to be constantly turning from loop to loop so I think telephone is better for that. I’m thinking about telephone loop foe Wednesday. Rhonda, did you go? Any new intel? Cheers! The east side of Telephone was groomed and trackset today. The west side is skier tracked. There are a couple big ice flows to navigate across. We did Telephone this evening. We left in the sunshine and finished in the moonlight which was great with the full moon. Conditions on the trail were absolutely amazing. Lots is nice soft snow with good tracks most of the way around. The are some ice floes at the junction the start on the eastern side which are signed and can be easily walked around, and another at the junction with Moose Loop, but nothing to spoil the enjoyment of the trail. Skier-set track on Telephone Loop. Conditions have improved considerably since gh’s Feb 14 report. The east side has an easily avoidable ice flow between the north intersection of Hostel Loop and Disconnect. There were also a few rocks sticking out in that section that were easily avoidable since they were on uphill sections (if you’re going counter-clockwise). The rest of the Loop was in great shape, other than the large ice flow at the north Moose Loop junction. I took my skis off for that section. The skier-set track is pretty good despite a deer that tried to trash most of the northern half. About -16C during my afternoon tour. Leftover VR30 from my Skogan trip last week worked well. I just found your description of telephone loop now. thanks Mike. Mountain Road to Mountain View, Moose Connector, West Crystal Line, and Crystal links all in great shape. The volunteer grooming crew has done wonders. Make sure you drop some $ in the donation slot at the Trailhead. Cold, fresh snow making for somewhat of a slower ski today but my group didn’t mind. – 15 to start and – 16 to finish. Trying to make the most of a nice day I drove from Field to the Yoho Valley Road later this afternoon. I spoke with the tracksetter earlier and he mentioned that he had done the trail on Saturday. Unfortunately the high winds overnight had filled the tracks in. I was left to follow skin tracks from At skiers all the way to just before the switchbacks. Beautiful scenery back there! Had a faster return ski, the steep section was a bit hard and icy which made it a bit faster then I wanted! Not to mention it was also pretty rough. Nice short ski around 10 km round trip. Had a wonderful ski today with great conditions and spectacular scenery! Started from the Field visitor center in a bitter cold wind to the Tally-Ho trail, which had been trackset earlier this morning. Continued on this fun trail to the natural bridge parking lot. From there continued on the Kicking horse fire road, also freshly trackset. There was a large group with Foothills Nordic (Teen ski and Marmots) that joined us at the parking lot. We followed the old fire road past the Amiskwi pass trail (would love to go explore there but it’s around 38km one way to the pass!) to the end of tracksetting beside the Otterhead River. A beautiful peaceful spot to have lunch. After lunch returned the same way. Made a short detour at the natural bridge then back on the Tally-Ho trail to Field. Round trip around 25km. Lake Louise. – two skis today, with an indoor lunch between. In the morning, starting 10am at -19C, we skied the Bow River Loop, clockwise. Good tracks, skier set in some 2cm fresh snow. Glide was marginal, scenery spectacular. Just as we finished, the groomer passed us, reworking the tracks. After lunch, now -13C, we skied up Tramline from the river to the top – very good tracks. Then Fairview, which a groomer had recently done, eliminating the tracks. Also cooler at this elevation, so glide was poor, and with no tracks, this trail was disappointing today. Returned via MLR (decent tracks, poor glide), and Tramline. Blue sky day; burned more calories than usual for these skis. Today, we explored many of the trails at Silver Star Nordic Centre at Sovereign Lake, Vernon, B.C. The snow hanging off the trees is amazing! The trails are wide, with double-track set trails and plenty of room for skate skiers in the middle. There were many vehicles in the parking lot, with midget ski races going on near the Day Lodge. The Black Prince Cabin was busy when we stopped to eat our lunch but people shared the picnic tables. People out here are truly into cross-country skiing! There were numerous happy people skiing with a temperature of -6C, perfect snow conditions, and a bit of a breeze. Visibility was reduced due to some cloudy skies. The cost was $19 per adult but we had a fun day! Arrived at a very quiet Pocaterra today around 11:30am at -15 degrees. Skied Pocaterra – Lynx – Amos – Meadow with variable conditions from perfectly groomed and track-set, skier tracked, deep powder and everything in between. Some needles and debris in treed areas but great day out! Sunshine and blue sky most of the day despite Calgary being clouded and windy when we left. FOUND a Garmin watch along Lynx today. It was still running when we found it so it must have just been dropped recently. Didn’t pass its owner on the trails so we dropped it off at the PLPP visitor centre. Call and describe it if it is yours! Pipestone: Great ski today in the sunshine albeit a bit cold starting at -22 and finishing at -16. Traveled Pipestone, Hector, Drummond trails. Good conditions with decent tracks. Green V20 wax worked well. Only saw cross country skiers all day! West Bragg Creek: Very good conditions today on West Crystal Line, Sundog Loop, Iron Springs, and East Crystal Line. All groomed and trackset. Air temperature steady @-16. Perfect grip on Swix VR30 (new snow -7/-20, old snow -10/-30). Excellent glide on new product Vauhti LF Polar (fluorinated liquid glide wax) -2/-20, available at the Norseman :-). Skied at Dawn Mountain Nordic Centre in Golden yesterday. What a pleasure it was to ski the freshly-groomed, double track set trails with lots of room for skate skiers in between the other tracks. It was great to see children of all levels skiing. The snow conditions were perfect, with a temperature of -5C. It was a pleasant outing. If you go to Golden, I would highly recommend these trails. The cost is $12 per adult. Excellent day of skiing at Emerald lake! Skied with my family and Foothills Marmots and Teen ski groups. No recent tracksetting but good skier set tracks along the lake and the alluvial fan. Mostly overcast but nice mild temperatures (compared to the deep freeze in Calgary!). Everyone had a good time. After the ski I dropped my family off in Field then went back to do the ski again. Instead of skiing back on the ski trail I skied on the opposite side of the lake past the lodge then back to the parking lot. Great day out! Kind of late on this one! Anyways had a very nice ski yesterday at Pipestone with my family and the Foothills Marmots group. Skied the blue #20 trail to the Pipestone River. Then back on #20 and the green trail past the barn. None of the trails were trackset, except for a short section near the barn. The Tracksetter showed up on his snowmobile as we were leaving. It looked as if it was groomed and trackset yesterday, and then 5cm of fresh snow fell overnight. It was -13C at 11am, and the parking lot was full. I sneaked by the crowds and was the first breaking the trail and had a good ski up to the bridge/campground at 7km, at which point I turned back. Rode Green -8..-15C worked great for me. I also went up Redearth/Shadow Lake today. As noted by Nick, the temperature was -13 at the start and -9C by late afternoon. It was lovely to see so many families taking advantage of the Family Day weekend to enjoy a few days at Shadow Lake Lodge. My camera battery ran out of power at the Lost Horse campsite (at km 7), so I only have photos of the lower half of the tour. Besides skiers, there were all kinds of other folks out on the trail. Some hikers (with their dog), a pair of split board snowboarders… slogging along with skins on, a couple or alpine tourers, a snowshoer and a father and daughter on fat-bikes. If my camera was working, I would have had a great “share the trail photo”, as a ski tourer and snowshoer stepped to the side to let the struggling pair of fat-bikers go by, with an XC skier approaching in the background. The fat-bike dad was making a heroic effort, with a fully loaded bike plus a full overnight pack on his back… churning slowly uphill in soft snow. Not sure how far they got. They were not very far up the trail at 4pm. Lunch at Lake O’Hara Lodge with ten Meanderthals. Wonderful ski up in -14 and new powder and fresh grooming from Thursday. Warmed to -10 by the time we got to the lodge. It is such a delightful time to be served lunch by their staff: homemade bread, incredible wild mushroom soup, a healthy salad, decadent chocolate mousse and beautifully brewed Jasmine tea and excellent coffee. It is always so hard to go back outside but a nice hour descent in perfect snow. Pipestone – We started at 11 am at -12c. Perfect clean new snow over recent track set. Fluffy, buttery snow made all downhills feel safe and fun. We lunched at the couches on the river (thanks Martin!) in weak sunlight. Some of our group set a goal of skiing every trail at Pipestone, which they achieved in 28 kms. Are they in decent shape still, or more like a squished marshmallow? Yes they’re in great shape. We brushed off the new snow and trampled down the snow in front. No recent tracks to the couch at Pipestone pond. Shaganappi Golf Course. Broke trail through the course this morning for a wonderful snowy ski. Great snow coverage throughout-easily ankle deep in most places. Pretty much all grooming has been covered up by the new snow. 4 others out enjoying the inner city powder. Fantastic option for a city ski if you (like us!) don’t want to brave the snowy roads out to the mountains today. Been skiing Loggers loop at Sandy McNabb in Sheep River Park over the past week. Mid-week, some of the trails (all?) were packed down, but not trackset. With this latest snowfall, even without tracksetting, skiers will be able to set tracks on a quite usable base, unless the parks set tracks – which may prove counter-productive, unless we get the 15-20 cms predicted. See you all there! Nakiska reports 9cm this morning in 24 hrs (5 the day before). Sunshine 3 cm in 24. Mud lake 1cm. So definately up slope characteristics, but not huge so far. See what today brings. Had a great ski today at Emerald Lake, not much 6p report, it’s just been amazing: fresh fast snow, -5C, calm peaceful day. Carrot -2..-12 ski wax worked well. At first started from Natural Bridge / Tally Ho trail, but turned back at the beginning of Emerald Connector trail, for it seemed rough and trashed. On the other hand, the Kicking Horse trail looked welcoming, though I wasn’t prepared to go west today. Newbies at Nipika…. meaning our first time skiing there. Interesting 14km drive on that road. Some of those truckers aren’t not respectful and bulky vehicles. Heard a few sketchy stories. Most were good for us. Anyways light to heavy snowfall all afternoon making the tracks a bit slow but silky smooth and silent. Quite a delightful outing indeed. The warming hut was more like a sauna. The lodge being quaint comfy and roomie plus a great friendly host. Having left Calgary at -20c then skiing at -3 was fantastic. Light snow all eve here in Radium. Should make for several days more of the nice sliding experience. Other than Nipika, any good SNOWSHOE trails out near here? Looking for about 4-6km. Some elevation gain is ok but not looking to climb a mountain. Wife and 2 young teenager friendly stuff needed. Thanks! The temperature on the car thermometer steadily crept upwards today, as I drove west, then down Highway 40 and up the Smith-Dorrien. It was -3C at the Chester parking lot, so that’s where we started. Skiing conditions were good all the way up to the lake and the Elephant Rocks. The return run was smooth and fast. There were lots of snowshoers out today, but they all stayed on the snowshoe trail. Great! It sure was nice to escape the cold weather! CASTLE LOOKOUT TO BAKER CREEK CABINZ- a perfect day on this trail. We started skiing with a light covering of new snow. Just past the campground the groomer came by, just in time for the weekend skiers. Hot sun around noon, and then by the time we were back at Castle, it started to snow. Skiing for the next while should be very good. Well, with a fresh trackset trail all the way to Stoney Creek, I had to ski the Cascade Valley. Excellent skiing all the way to Stoney Creek with not a rock to be seen. Snow speed was moderate. Temperature -6 at the Warden Cabin in the afternoon and -14 at night. I rebroke the trail from Stoney Creek Bridge to the Elk Trap area. There was roughly 15 cm of new snow in the track. The snow was slow with a mid dense layer which made rebreaking the trail somewhat difficult. The skiing is excellent with no rocks on the trail. All the little creeks can be skied across. Snow pack measures close to 50 cm at the Elk Trap area. Feb 14 spent the day in PLP. Cold but still and gorgeous. New snow made it very slow but we weren’t in a hurry. Beginner with us had a wonderful experience on trails near William Watson Lodge, and on Lodgepole and Braille. Didn’t see many other skiers. You missed a lovely day despite the cold. Confederation Park – Beautiful day skiing Confederation Park yesterday. Trails were in perfect condition. Started at a balmy -7C! Kananaskis Village – We spent a couple of hours on Terrace and Kovach. It was minus 8 (heaven!) on the car thermometer with stunning blue skies mid-afternoon when we started out. The conditions couldn’t have been more perfect! We had good grip going up the hills with blue wax (sorry, I can never remember the number values on the waxes). The downhills were pleasantly fast, but not crazy with the new snow, and awesome grooming! It was great to ski some nice mountain trails without a really far drive! We missed skier Bob, but we did run into his friend, Peter while getting our apres-ski coffee in the Village! What a great day! Peter Lougheed PP: Another day of cold slow snow that finished with us seeing the end of the tunnel. William Watson Lodge -23 C at 9:45 am. With VR30 wax, skied Amos to Lynx and down to Pocaterra. There was little glide in about 5 cm new snow on the tracks. The ski up Pocaterra to Tyrwhitt meadows was pure agony following skier set tracks in increasing depths of snow. Just like days of old, climbing with skins – shuffle-shuffle! Thought glide would improve in the sunny Tyrwhitt meadows and we weren’t disappointed. After a quick lunch at Elk Pass at 1:45 pm we skied very fast snow over track set down Elk Pass trail to Fox Creek. The best Elk Pass downhill in many years. Fox Creek and Moraine were skier set tracks in creamy snow that now provided very good glide. Met the snowmobile grooming Moraine at the north end. Wheeler back to Elkwood parking was more wobbly but maybe just my legs now. All trails we skied had no tree debris and, as MaSid noted, there were only a few snow bombs on Elk Pass trail. The sun shone all day and it warmed to -16 C by 3:00 pm. The End! Thu feb 14: west elk pass. -16 to start at elk pass pkg 1230. -9 on return at 5 (spring skiing!). Bluebird day and reasonable temps made for excellent couch surfing and meadow skipping. A bit breezy in open areas and some minor tree bombs along the elk pass trail (bumpy on the down hills, but minor). Fox creek has decent tracks and smoother sailing on the return. Boot top trail breaking in the old track through west elk meadows to hydroline. Shin deep off the track. The route is now a bit straighter on the traditional later season line. It was nice to see JeremyN at WBC today. We also enjoyed a lovely afternoon ski around Moose Loop. The little bits of snow have been building up over the most recent grooming, but that made for silky skiing today. The warmer (-7C) temperature sure helped with glide! As GH noted, there is a nasty ice flow developing at the Moose Loop-Telephone Loop junction. It’s possible to work around it on Moose Loop, but it would sure be a surprise if you were skiing quickly down that last hill on Telephone Loop! Hopefully, a decent amount of snow falls on Friday/Saturday. That would be enough to bring all the WBC trails into great condition! Yes, it was a stunning afternoon out at WBC! After the deep freeze, -7 felt like spring skiing. Glad to see an obvious full recovery from your December accident, Jeremy. And nice to see a Strava map to go with your informative pictures. I also skied WBC on Thursday, starting at Allen Bill Pond / Ranger Creek. Easy trailbreaking though 4 inches of faceted snow on top of an icy January base. Skied Iron Springs, Crystal Line, Moose Loop, Mountain View west, Mountain View, Loggers, and then Elbow. Lots of folks in the WBC core area trying to shake the cabin fever like myself. I was happy to see a school group. Elbow was in good shape up to the “picnic table cutoff” despite the “marginal snow” warning sign. The southernmost bits of Elbow and Iron Springs had been groomed when I returned, and the grooming had stirred up some dirt. Still the skiing was fair in this area. Hopefully we’ll get some more snow this weekend. Every bit will help. Geoff led Meanderthal ski this afternoon, Banff, Snowshoe Hare, Banff, Bruin, Silvertip – Banff return. -8oC (V30) with powder snow on all the trails except the groomed Banff trail. 12 km loop. Sunny and very good. I parked at the Evan Thomas lot and skied Bill Milne. The tracks were in good shape, not too fast but offered decent glide. The detour around the ice flow was ok. There was some grass and twigs sticking out but no exposed rocks. There was a little stretch that parallels the highway in the ditch with a bit of sand chips mixed in the snow. From the Ribbon Creek parking lot I skied Aspen, part of Kovach and Terrace. All were freshly track set and in great shape. Just having returned from 4 glorious days skiing the trails at Nipika, I wanted to give a 2 thumbs up to the condition of the trails and feel of the place. Conditions are currently great as daytime high temps have been in the -8 to -14 range for the past few days and excellent tracks set after Tuesday/Wednesday snow. No captions necessary this time! This may be the best day all month: -10 to start and – 8 at the end! The snow was even fast, given the warmer temperatures. Picture perfect day at Chester Lake. Although Mud Lake temperature on Avalanche.ca was -30C at 7AM today, 10 Meanderthals started from the Chester Lake parking at 10:30AM at -19C and finished our 9 km trip to Chester Lake and back at -7C! With over 15cm in the last week and 2 cm fresh snow overnight the trail conditions could not have been better. Skins not necessary. The sun shone in a magnificent Alberta blue sky. The mountain views never disappoint in these conditions. Just skied Fairview, about 30 minutes after Jeff groomed it. It was awesome!! I stoped by the boat house to tell him how good the grooming was and his choice of where to stop and start the tracks was perfect. I like that he leaves the track in on ALL the uphills, I wish they left more track in on the climbs in PLPP, lots of people can and want to stride up the steeper hills, and it’s obviously more enjoyable when there’s a track. MLR hadn’t been groomed for a while but the track was OK, even with the Fat Bike tire track that zigzagged across the classic tracks (im serious) tramline looked like a herd of Rhinos had gone down it. Staying in LL tonight and will see what is groomed in the morning. Trails are in excellent shape at the Golden Nordic Club for classic and skate, there are promises of fresh snow arriving tomorrow and I am so excited that it is warming up to seasonal February temperatures! This Saturday there will be demo skis to try out and a food truck at the centre for hot lunches. PLPP. It was certainly nice to see the snow Pat Davis referred to in her report. The new grooming on Elk Pass was covered by 1 or 2 cm of snow. Tyrwhitt and Whiskey Jack had 10 to 15 cm of silky, beautiful snow over the last grooming. We got a late enough start that 3 others had broken trail over Tyrwhitt. AND THE TEMPERATURE: minus 9 around noon, minus 7 at 3 pm! We had to remove all those minus 20 layers we had planned on using. GREAT DIVIDE – very few people out today, we saw 7 people. The abundant new snow is soft, cold, and slow. Felt like hiking vs skiing!! The groomer was out this aft, the trail will be lovely after that. Great to be out….saw lots of wild cat tracks. It is a winter wonderland out there right now. Maple Ridge has a roller packed perimeter trail with some trackset and skier-set around known hazards. It’s still pretty thin in spots with pole tips hitting asphalt, but it’s certainly skiable. Started from ribbon creek with fresh snow and -24 @ 1030. -10 on return at 4. Knowing helen would be in the area later, went up sunburst, hummingbird, high level (ccw) and then skogan loop (cw) before heading up to the pass proper. After 5 minutes at the pass helen popped around the corner, so timing was good. We had a good blast down, if not a bit cool. It’s the only time I’m faster than helen! Long time since I’ve done skogan, and a reminder that the pants need sewing. All trails were in excellent shape with the new snow and lack of travel during the cold snap even though the grooming was old. Finishing the day warming up at the village now with helen over a dark beer. Excellent day. Maybe a “critical” patch to sew on for Martin’s birthday on the 16th. He has not committed to which couch he might be serving Kool Aid at? The beer at the new fancy hotel in the Village was indeed tasty as were the snacky chips they distribute. Great skiing with you again Martin and what a surprise to find you at the top of the Pass!! I did that route today as well from the Nakiska Day Lodge. I should have been paying more attention. I likely went by you at some point. I got down to the lodge at 4:15. The snow was good. Dang! Sorry we missed you GH. In addition, good controlled but reasonably fast descent from top to bottom, making for an exhilarating day without any concerns. Yes, the snow was as good as I have seen in a long time on the entire route. I saw a ski track heading off towards Marmot Basin about a half a km from the Skogan loop fork (on the west fork heading up). I wonder if someone knows a route up that way through the cut blocks to mid mountain lodge. That might be fun now that the marmot basin trail is apparently dead for ever. Do you know anything about a viable route up that way? Yeh, I saw that. Very tempting to explore. It seemed like it was heading that way, but don’t know for certain. That track leads to the Marmot hydrology site used by the Center for Hydraulighy from USask. There is a huge drainage very deep wide with extreme steep walls that you have to cross to get over to Marmot. Started at the Mt. Kidd Campground, -22C, and skied north on Bill Milne to the ice flows, slowly breaking trail in some 5cm of fresh snow on the trackset. Just before we arrived at the ice flow area, the groomer passed us heading south, laying new corduroy, but no tracks on his first pass. The ice flows were snow covered, but hard to ski as our poles got no grip on the ice – the detour is still the best bet. Better glide on our return ski, though less lateral stability without the tracks. No doubt they are in place now. After lunch indoors at the Kananaskis Village Center, we skied about 10km on the Village trails (Terrace, Link, Kovach, Aspen), generally in good skier track sets. -12C at the end, and glide getting a bit better. Note – a 2nd floor pipe burst at the Village Center, almost over the post office, so the place is quite a mess, with 13 fans working as they try to dry things out. Even though it was cold, the sunshine and the lack of wind made for a very pleasant ski. There was recent grooming and track setting outside of the driving range. Good coverage with the odd grass showing through Driving range had last night’s snow over grooming. yesterday it snowed steadily all day, from first light to last. The snow as almost microscopic; that is, very small particles. Being small, they packed more densely than one would expect, so breaking trail thru them was tiring. Also, being small and cold, they provided excellent grip (good) but darn little glide. (Not so good) It was a lot like skiing on sandpaper. Total accumulation was about 4-7 inches. Once groomed and track set, things should be good and natural hazards should be buried even more. Until that time, it’s going to be work. WBC this afternoon: Lower West Crystal-Moose Connector-Mountain Road-Mountain View-Loggers-East Crystal-Sundog East-Sundog West-upper West Crystal-Middle Crystal. Very good conditions throughout with faster skiing than of late as the tracks wear in a bit, using both polar glide and grip waxes. Temps hit a balmy -16 or thereabouts which helped with the glide also. In addition, I threw in an out and back south on Elbow to about the 1.5 km mark, which skied very nicely and was largely trackset under the recent snow. I would be very careful if contemplating the straight S facing downhill in the final stretch towards the first Iron Springs junction- I didn’t go quite that far today, but ten days ago- it was littered with exposed rocks. I did a spin around Hostel Loop, to check out conditions with a bit more snow on previous roller-packing. There was no track setting on the east half of the loop, but no hazards either. The segment between Snowshoe Hare and Telephone Loop had one lane of track setting, which was covered by about 4 cm of silky new snow. Nobody else on the trail, other than a pair of deer. More snow fell this evening, so conditions should be even better tomorrow. Mon feb 11: bill Milne. Ribbon creek to wedge pond and back. -24 @1030. -18 on return at 5. A cm of fresh in the tracks made for smooth going. The reroute around the ice flow was decent enough with the fresh. The odd stick or grass, but no issues. Wouldn’t want to be on the roadside portion on a snow day with plows running. On the way back it was a bit gravelly from road sand, gave the skis a light stone grinding. A bit blown in along the open meadows but fine everywhere else. Nice in the sun. Cold and slow on the way back in the shade. Nothing a pint of stout at the village in a warm pub couldn’t fix. Brewster creek was recently groomed and with the cold weather I figured it hadn’t seen many visitors. It was a cold start but after about 15 minutes I was warming up quick. Their were a few other groups and some snowshoers. I continued past the Sundance lodge for about 1.5 km to the Brewster campsite then skied back. The trail was nice some bumps and a couple rocks other then that it was perfect. A fun ski down! A SHORT but SWEET ski into Boom Lake was the order of the day for we 3 Meanderthals who were willing to brave the -21 C. start and enjoy the -15 C. finish. Only car in parking lot @ 09:45 but at least a few people were getting ready to ski as we returned just before 1pm. Our return track was much smoother than the walking track we had to ski over en route up so I am sure late starters got an even better glide on their way out. A request for anyone heading out to Mt. Shark Trailhead. Upon return from a cold, yet beautiful ski into Bryant Hut Shelter this weekend, I appear to have lost my prescription glasses. I think they may have fallen on the ground at the Mt Shark Trailhead parking lot. We were parked near the outhouses. The glasses have a turquoise frame and were in a black cloth sack. Should anyone find them please respond to this post. Thank you. An arctic –style start was on the menu for us, with -32°C at 9:45 am in the parking lot of the Lake O’Hara trail. For David and I, this was our 30th consecutive year ski visit at the lodge in the winter for the Pink Andalusite Ski Club Classic, with lunch served and warmth by the fireplace. VR30 worked very well for the grip uphill, although given the abrasive nature of the snow, not sure if grip wax was really needed! Very good double trackset conditions all the way to the doorsteps of the lodge, in spite of no glide at all. Saw a few people coming down from a stay at Elizabeth Parker Hut. Bright sun hitting our faces in the openings around km 9, as we were going up, was much welcome. Only 2 other groups had dared to challenge the weather for a lunch in the lodge. Left the lodge at 2:30 pm under a balmy -20 C. The glide going down was much better, but still slower than for warmer conditions. Always great to return up there, once you ski the 1st 5 km out of the cold air sink in the valley. There were very few cars from the Lake Louise and Sunshine ski hills, as we were driving back out of the mountains. I was out at West Bragg Creek this aft. Did East Crystal, Sundog to Loggers, back up and down Sundog and then parts of Middle and West Crystal. I found the snow pretty slow on VR20. I’m guessing that’s the norm in really cold weather? Otherwise it was nice afternoon. Didn’t really feel the cold, except a bit on downhills though my only exposed skin was my nose and my eyes 🙂 The trails are in good shape but, as pretty much everyone has said throughout this season, need one good dump of snow. Yes, there were a few brave souls out at West Bragg Creek this afternoon, including XC skiers, snowshoers, several fat-bikers and one dogsled team- heading out on Telephone Loop and Demi-Tel. It’s hard to get much glide at -24C. As ChrisD noted, you didn’t really feel the cold, if you were bundled up properly. As the Norwegians say… “There is no such thing as bad weather – just bad clothing”. I have had success in using Dermatone on my face in really cold weather. Spray Valley loop: -18C, with a cm snow over recent grooming. Green wax did the trick with good grip and glide. The tracks were in good shape on the east side, and on the West, were somewhat sliced by various skate skiers. A couple of fat bikers ignored the signage as well as a few hikers but mostly stayed out of the tracks. Elk Valley Nordic center has fantastic conditions for skate skiing yesterday (Feb 9th) despite the extreme cold warning. My car suggested the temperature was actually about -14, and there was excellent glide. I was at WBC on Saturday. With the sun and a few layers on, it was quite pleasant. We went up Mountain View, Moose Connector, West Crystal Line and then up and down Sundog. Pretty slow on the descents but then I have skin skis with about -10 glide was on. I was in no rush as my partner couldn’t find her boots and had to use her telemark gear. She was very warm! Some grasses sticking up here and there, but overall good conditions and you can go for coffee at Heart Cafe in Bragg Creek afterwards 🙂 which I do after every ski or bike out in WBC. Parked at the Troll Falls / Stoney Trail trailhead. I decided to take in Hay Meadows based on Bob’s report from a few days ago, and JeremyN’s route to Skogan Pass from a couple of days ago: Hay Meadows – Ruthie’s – Skogan Pass via Skogan Pass Loop – High Level – Sunburst – Skogan Pass Trail – Troll Falls Connector. The trails had 1-2cm of fresh snow over the trackset. No wind all day. Temperature at the trailhead at 1030 was -26C. From the upper Skogan Pass Loop junction to Skogan Pass, it was more like -30C. Back at the car at 1500 it was -21C. Four thin layers of VR30 provided great grip for the entire day. I didn’t herringbone all day! For glide, I had ironed in cold low-fluoro glide wax, scraped and brushed, then wiped on a layer of cold low-fluoro liquid glide wax and corked it in. Glide was ok in the fresh snow, and quite good when I skied back down my tracks. Worked way better than graphite wax I had tried a couple of days earlier. A tour of 2 golf courses. Maple Ridge and Shagganappi. Adequate snow coverage on Maple Ridge. A few bare spots at Shagganappi. (Take your old skis) Ski poles tend to slip on the ice on both. The groomer was out on Shagganappi later this afternoon. Confederation was groomed Friday afternoon. The green and blue trails were groomed for classic and skate. Tracks were full depth and rarely hit the ground. Grooming was ongoing when I left. I hope the purple and yellow got groomed. Stadium was also not groomed when I left. There were skier set tracks on the purple. Friday conditions were the best classic sking condition at confederation since before Christmas. Some snow fell or blew in on the latest grooming. All the groomed tracks had a decent amount of snow. There were a few places elsewhere that had some grass showing through. I saw two other people skiing despite the cold. I skied in across Canmore park. There was no grooming there but there was enough snow for skiing everywhere. Spray River West – With another c-o-l-d weekend looming we decided to ski from the Banff Springs Hotel out 10 km. just short of the 2nd Spray River Bridge. At our 9:30 start the temp was -17C and that pretty much held over the whole time we were out. There was about 1 cm of fresh snow over good tracks, but still the glide was not very fast, given the cold temperatures. We were first out of the gate this morning before we were passed by another skier about the 8 km mark. Skiing back to the parking lot we saw lots of other hardy souls out. Kudos to Banff Park staff who have put back numerous big signs asking walkers, snowshoers and fat bikers to stay off the ski tracks, and pointing them to their trails. Except for the first 700 m. no one had walked on the west side trails. Bravo people!!! Bill Milne and I had a visit today. I started at my cheater parking area off highway 40 and turned just shy of Mt Kidd campground. Let me start by saying it’s Friday and I had the pleasure of skiing in the beautiful Kananaskis. Woot woot! Due to the wind today and likely last night, the classic trail is wiped out in several areas where there are fewer trees to protect from the wind. Ok for the ice flow area…I took the detour, skidoo track on the way out but boy was I curious about the ice flow and what it looked like. Curiosity killed the skis on the way back as I took the ice flow route/the regular trail and realized it was a poor choice when I attempted to ski around it and found myself a foot in frigid water. ….yes water. It’s prob obvious to most people it’s not ice everywhere….the river still flows. Well in .19 temps that leads to an inch of ice immediately freezing on ones skis and a 5 minute stop to get it all off. Then I turned around and went back to the detour to finish my ski. It might be good if the groomer places a caution sign at both ends of the ice flow so other curious people stay away…just sayin’. My curiosity overtook my common sense today. Signs are up at both ends with warnings and a map of the reroute. Years ago I sunk over waist deep in that ice. Glad you made it out okay. Thanks for putting up the re routing signs. I appreciate the work you do to give us such great opportunities to ski! Continued….that was me above. After Loggers I encountered the first new grooming, and finished up on the freshly packed East Crystal and Sundog Loop. I was also out on the West Bragg Creek this afternoon. The 3 cm of snow that fell in the past 24hrs was at the low end of what had been forecast, but every little bit helps. By mid-afternoon, most of the trails had been groomed and trackset (often just one lane). I went out West Crystal and Moose Connector and then continued around Moose Loop. As Steve noted, the cold snow was a bit slow and the temperature never got above -19C. But as long as you kept moving, it was not too bad. The forecast is pretty cold for this weekend, but if you want to do a quick ski, without a long drive, West Bragg Creek is ready for you! I did a couple of laps this morning, snow cover is still thin ,but adequate – there is no grass showing now. No machine grooming yet when I left at 1pm but the skier set tracks were just fine. Cold skiing into the wind (-19C when I started) but I wore goggles instead of sunglasses which saved the day. From Sunshine Road parking lot. The tracksetter came out just before the sun went down. The tracksetting is a little rough due to snowmobile packing and a lack of fresh snow. It is still good though overall. The Healy Creek trail is generally in very good shape. No rocks. It took the short cut up to Brewster Creek trail. The short cut has had snowshoers go up it . It is fairly well skier packed. Fair to good conditions with some rocks. Do not use new skis on the short cut. Another 20 cm of new snow and it should be generally good to very good. The Brewster Creek trail is generally in very good condition. to Sundance Lodge. A couple of rocks under the trees at the food zone- this is normal. I hit a couple of rocks coming down the hill at night. They were under a tree. Generally the hill seemed very good otherwise. 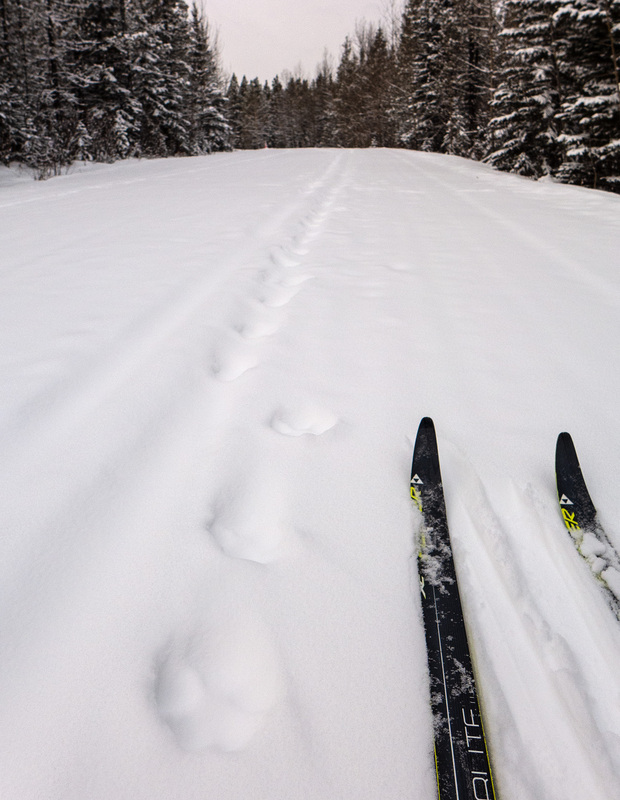 I followed fresh cougar tracks in the skier track for quite a long ways on the way down at night. These cougars really have to learn backcountry trail etiquette and not to step in fresh tracksets. From Sundance Lodge to beyond the old run down cabin and creek, the skiing is snowmobile packed with about 7 cm of new snow on top. Some rocks in a few sections. Generally the skiing is good to very good otherwise. The trail beyond the creek crossing past the old run down cabin has been snowmobile packed up to the first avalanche slope apparently. I broke trail for a ways following a bunch of wolf tracks. This is a very good time to ski this trail as it is rare to have snowmobile packing so far up the valley. Get it while it is good. Skogan Pass/Summit: via Hay Meadow incl. ascent Skogan Loop and return via High Level to lookout & down Sunburst (recommended travel direction). 26km. Great recommendation Bob. Minus 17 start on oft-mentioned abrasive snow. MANY layers of VR40-30 and adjusting base clothing layers to manage freeze/thaw inside my coats! LF4 even had marginal glide. Found unfriendly windchill at pass and in cold air sinks along upper reaches of trail so REMEMBER, take lots of extra layers this weekend. Track & corduroy was the most pristine & as well layed as I’ve ever seen here. Fun yet very SAFE descent. Sorry I didn’t slow chat Alf! What a wonderful afternoon on the Skogan side of the Ribbon Creek trails! Temperature hovered around -9C for most of my tour and a few layers of old Swix Green worked great. I started out on Hay Meadow, which is really a gem of a trail when it has lots of snow and beautiful grooming. Then up Ruthies to Skogan and along High Level to Hummingbird Plume Lookout. The crumbling old fire lookout has no view at all… but a short off-trail ski takes you to the fabulous view of the lower Kananaskis Valley. As I layered up for the descent, I glanced at my watch. 9 minutes later I arrived at the Skogan-Ruthie’s junction. And another 8 minutes after that I was back at the Troll Falls parking lot, via lower Skogan and the Skogan-Troll South Connector. It’s a terrific ski down… I don’t blame you for not slowing down, Jeremy! There were a couple of ice-flows in the usual places on lower Skogan. Otherwise, the snow and grooming conditions were perfect! Spent an hour skiing around the golf course this aft, air temp -9 C, snow temp -13 C.
Thin snow pack and skiable but more suitable for skate skiing, although the driving range had an adequate base and was nicely trackset to practice classic technique. Sure hope it snows tonight as forecasted. Noticed a lone coyote wandering about the fairways. Did we pass each other?? I had a brief outing, “thin but skiable” mostly, but made the mistake of skiing down the hill going east from the clubhouse just outside the driving range, and hit many stones on the way down. Ouch! Even if more snow falls, that section should be avoided. Inside the driving range is much better. The parking lot was open today. Moraine Lake Road – 3 Track Setters / 2 other skiers. Perfect and -10 at 4pm. Cannot add much to Marc and Leslie’s thumbs up to Cascade to Warden’s Cabin except that we started in -19 and ended in -9. We four ladies saw maybe 9 people all day, and two of us who skied to the end of the grooming, did not see a single soul all the way back until we met one gent just starting up. Not a single boot or snowshoe track to be seen from the meadow onwards….not even a single pine cone in the tracks. PERFECTION! A very enjoyable ski this afternoon. -9 at the car at 2:30pm and a little warmer at 4:30pm. I took Crystal out to Moose Connector, there was a hazard warning sign at the bottom of the hill by the bridge I appreciated the information and happily continued anyway, the immediate steep uphill has good coverage, I followed the Moose loop trail counter clockwise. It is worth slowing for the far drop to the creek, there is snow, some ice and a narrow way through. Moose tracks indicate that the tastiest food is always on the other side of the trail, alas I did not catch a glimpse of the animals themselves. The coverage is almost entirely good but the hill near the Moose Loop/Tom Snow Link is still poor so going this way means you climb and can easily avoid the rough spots. Back at Mountain Road I turned right, with good track setting, to the Mountain View junction, another warning sign here but the trail is packed and was good. VR30 gave good grip and reasonable glide, I really should put on some colder glide wax. We also skied the same route as Jane but added the West Mountain View Trail to the loop. It has sections that are quite good, but overall I wouldn’t bother until after the next snowfall. Great to find some moderate temperatures and warm sun today. Cascade Fire Road to the cabin was freshly track set and in excellent shape today. -18C initially, but improved later. Ribbon Creek Ski Trails: Minus 23C to start at 10:00 am with only a slight north wind. Compared to Tuesday, VR30 kick wax and green glide worked well. From the Village skied Bill Milne south to Evan-Thomas Creek. Thanks to Jeff for snow sled packing a track around the BIG ICE FLOW. Returned up Ribbon Creek, Terrace and Terrace Link back to the Village. Bill Milne trail is still in pristine condition with a few short Fat Bike ruts south of the golf course road. Trails closer to the Villager take a beating from the walkers but they have stayed out of the ski tracks. It was a balmy minus 12C at 2:30 pm. A beautiful day in the valley! Ribbon Creek – Great day skiing on fresh trackset trails. All in great shape, lots of snow. Warmer than we expected at -12C and no wind. Blue wax worked perfect. Was skiing around Emerald Lake and the Alluvial Fan trail. There’s lots of snow, and the trail from the KHSC shop to the end of the lake is in great shape, albeit a little uneven here and there. The alluvial fan part of the trail got really windblown a couple of days ago, so once you clear the trail out of the trees (heading clockwise), the trail is essentially skier groomed and a little rough ’til you get to the bench. The temperature was about -10 with clear skies and no wind, and as usual, the whole area is just stunningly beautiful. Well worth the trip! It’s been 2 weeks since my last ski at West Bragg Creek. A light 4-5 cm snowfall at the beginning of this week added a bit more snow to the meagre snowpack. And the groomers have harvested snow from the parking lot and moved to spots on the core trails that needed the most help. All of the core trails have been roller-packed and there is some track-setting, where the snow depth is deep enough. It was -14C at mid-afternoon, but the snow was still very cold and I had more than enough grip with old Polar wax. I didn’t hit any rocks and only small pockets of needles or grass on my loop of the Crystal core trails. Trails beyond the core have also been roller-packed, but the signs warning of marginal conditions are still up. Hopefully we get the 5-8cm of snow that is forecast to fall at West Bragg Creek on Thursday night and Friday. It might be enough to bring the trails up to good conditions. Wed feb 6: west elk pass. -22 to start from the elk pass lot at 1030. -19 on return at 5. Warmer at the south end in the morning than the village. Skier set track along elk pass trail. First section tracks to hydroline turn off obliterated by sled pulling snow shoers, flattening both tracks. Soft skier set track past there. The sun in the meadows trumped the light north wind. the meadow track is back in through to hydroline, along with the route through the upper blueberry meadows. Both travel well under foot although some bottomless pole action here and there. Boot top trail breaking off trail with light touring gear. Nobody had gone up or down blueberry today. Couch HQ got a slight increase in back wall height due to the north wind. The snow dinosaur Dino is starting to take shape on its perch mid way through the meadows. Found a zip lock bag bandage kit with green handled scissors by the blueberry junction. It’s on the lost and found counter now at pocaterra hut along with an odd collection of single gloves. And the best track of the day was fox creek on return. Smooth, fast and not washed out. Cascade. Started at 1 pm, minus 17. Track setting from yesterday was in excellent condition before the bridge. After the bridge it was softer, but still good. Only one other car in the parking lot when we started, but many more when we finished. Everyone is waiting for the daytime high temperature! Decided today to take advantage of beautiful grooming all the way to the pass via Hummingbird Lookout, Skogan Loop, coming back via the main trail. I haven’t seen any signs of activity on trails until I hit High Level intersection on the way down. I was hoping for a warmer weather up there, but none materialized, it was still very, very cold. I was glad I brought along a down jacket, spare toque and extra pair of gloves for the wicked downhill. There is a big ice flow, as usual, at the bottom, but it can be navigated with no problem. Some parts are still a bit thin, with dirt showing here and there, but everything can be avoided even at full speed going down. A great day, highly recommended. Having owned a cabin in Lac Des Arcs for two decades (up until the flood), it always feels like coming home to ski the trails at Ribbon Creek. Nothing much more to add to Keith’s report yesterday, except we started in -19 and ended in -13, evading the littered cones in a few places. Lots of walkers abound at Kananaskis Village but the EXCELLENT signage keeps them out of the tracks. We met the Norsemen skiing up clockwise as we were descending counter-clockwise from Ribbon parking lot. It was delightful to run into Val W. whose children and mine were in school activities/hockey together, while growing up in Deer Run. Thanks Val for recognizing me; rather hard in these cold weather disguises. Goat creek trailhead to Spray river bridge and back. It was -18C at the start at 11:30am when I started skiing and blue skies. The tracks are in pristine conditions although the glide was not fantastic, making for a very safe descent to Goat creek bridge. I guess the cold weather deterred hikers and snowshoers as I could not see a single print in the snow. 4 Meanderthal ladies were happy to have persevered with today’s plan to ski a 15 kms. circuit of Great Divide/Peyto/Fairview Loop/Peyto/GD, with a late stop for tea at the Couch, which was still getting sun at 3pm. We started at 12:30 in minus 22 and ended at 4:00 in minus 17. Agree with Keith on slow snow and glide but the bountiful snow with newly track-set on Fairview and Peyto, made up for diminished speed. Walkers had ruined both sets of tracks on Upper Tramline…maybe Tramline should be like Goat Creek with one single track and everyone else using the rest….? Coming down Fairview towards the Chateau, we noticed a new trail #4 which appears like a shortcut to access the regular #4 to the Lake. It will be nice to revisit Ribbon Creek tomorrow. Thanks for great reports!!! We are heading to Lake Louise/Field for a few days and wanted to stop for tea on MaSid’s Fairview Couch, sans pup with the incredible eyes (we are going to miss our ski buddy this trip). Thanks for the great trip report! Kananaskis Village: Minus 31 C at 9:00 am skiing the upper trails – Terrace, Kovach, Aspen, Kovach. All trails were newly groomed and track set. At the start there was poor glide with VR30 and cold glide wax because of large frost crystals in the tracks. After turning south and reaching sunny spots glide improved. Squirrels have been busy harvesting spruce cones and one spot on Kovach was completely littered. Otherwise the tracks and forest were pristine. Another loop was skied. At 11:00 am the air was warmer and the tracks faster – although not really fast. Finished the second loop enjoying great skiing then went indoors for lunch. That pretty much ended the skiing and we all went home early and happy for our cold day out. Air temperature at 2:00 pm was minus 14. Hey Bob – Skogan Pass is now groomed and track set! But you probably already know this! Kananaskis village – It was -23C when we started skiing at noon. We had hope to skate ski Bill mine but has to change plan as there was a massive ice / water flow on the trail a few hundred meters after the bridge over the Kananaskis river. We skied Ribbon creek and the Link that were skier trackset (with a lot of boot prints until we reached Ribbon creek in the valley), then we had a lot of fun on Kovach, Aspen, Terraces, etc. as all these trails were recently groomed and trackset. A nice blue sky day. Started at 1:30 pm under a balmy -27 C and light wind, with only 5 cars in the parking lot; most were from mountain bikers. Skied Mountain Road, Mountain View, Loggers Loop, Elbow, Iron Springs and Sundog trails. Painfully slow, although with nice and somewhat thin coverage. About 5 cm of fresh snow over the hard sun crust developed during the previous warm spell. The grooming team out there may have some tricks up their sleeve to trackset in those not so optimal conditions, but it is still thin, especially in open areas like Mountain View and parts of Elbow and Iron Springs. But no visible rocks. Was good enough for me to get a good cold weather workout in the outskirts of Calgary, as opposed to drive in the mountains under wintery road conditions. I kind of enjoyed skiing in such cold temperatures, as we have been spoiled so far this winter with mild weather. It forces me to tune up any clothing/equipment when facing such harsh conditions. 0800hrs, -26C, light snow, gusty wind in open areas. The storm snow of Feb 1 and 2 was still soft this morning. The skier set track on Wheeler and Amos did not firm up overnight. Glad to find fresh trackset on Lynx. Lynx has only received maybe 5cm of this storm load. Passable kick on green Swix. Take Bob’s advice and put on appropriate glide. My skis sounded distinctly raspy on the cold fresh flakes. Watch for signs of frostbite. Open areas are a hazard. Still snowing lightly and cold at 1000. Skied from Banff along the Spray River to the Goat Creek parking lot and back today. We didn’t mean it to be a long trip but while we were at it, we kept going. I guess we met Helen on the trail. I only saw approximately 25 people all day. Three fat bikers created a path beside the ski trail. A family of snowshoers did the same, as well as one adventurous runner. I returned on the east side. Pleasant outing; crazy wind at the Goat Creek parking lot but not elsewhere. Very consistent -16C all day. PLPP – north end. New snow over latest mega grooming, anywhere from 3 to 7 cm. Expect skier set tracks only. It was cold -12C on start and -19C when I finished. Strong wind from north made open area like Pocaterra parking lot brutally cold. Rode blue multigrade worked very well in lightly falling snow. I have only skied cookie 24K race trail as conditions were slow but silky smooth. Did the south end and it was significantly warmer -5 to start but dipped down to -15 at the end around 3. All the grooming was covered and the new snow was around 12 cm in depth. Should be great once all the snowfall is done and the temps warm up. To echo fallsalot and Vittorio and Gina, yes, temps at Elk Pass Parking Lot yesterday were -2C @ 11am and -14C at 3pm upon return. The warm air supported us all the way up and over Elk Pass and Thyrwitt but within 100m of the descent north from the T. meadows we hit the cold air that had managed to push itself south down the valley. VR40 worked well all day, with a small VR45 cap early on when the snow was warmer going up the Elk Pass Trail. Skier set tracks throughout after Friday’s nights snowfall. What was interesting was that the new snowfall was significantly deeper on the Elk Pass trail than it was on the highpoint of Thyrwitt. In fact, I suspect that the north trails didn’t get the long-awaited coverage based upon how little new snow there was at the Whiskey Jack – Pocaterra junction. Odd. Skied at PLPP today starting from the Elk Pass parking lot. Anywhere from 15-30cm of fresh snow brought it down to a single skier set track all the way to Elk Pass. There was a lot of hopping out of the tracks for oncomers as the trail was fairly busy. I was the first to go down Hydroline, up to Patterson, but was happy to see someone had broken trail from that point the rest of the way down. The car said -13 when I started but was closer to -20 and windy by the time I returned. Brr!! Glad to get out today before it’s even colder tomorrow! Enjoyed the couches at Pipestone last weekend. Thanks for making them! There were a lot of people out enjoying the Lake Minnewanka area. this afternoon Lots of snowshoers having fun near the parking lot and on the closed road. No track setting today, ski-tracks only; no tracks to Bankhead, only up the Cascade Trail. Mostly a single track, it seemed not many ahead of us interested in breaking trail in boot-top snow. Very pleasant once you are going up the hill after the meadow, no wind and lovely to be out. Skied to the bridge/ campground – no tracks beyond that. Far enough knowing we’d be facing the wind going home anyway. Slow and wonky coming out, still nice to be there – especially since we probably won’t be out skiing tomorrow if the forecasts are correct! Still marginal conditions at Confed Park; whatever snow fell in there is windblown in pockets, while the icy/grassy/dirty base persists elsewhere. Did a few rounds on the driving range as the main golf course area is worse. If you need the exercise and would rather ski than run prepare yourself for laps: clockwise, counter clockwise, race a friend, race a friend in different directions, do that the other way round, find another friend, repeat and so on….., VR30 had some glide but not a lot. Canmore Nordic – a study in contrasts this afternoon. I arrived about 1pm to -17C and very strong south-easterly winds. Tracks in the stadium area were totally obliterated, and most surface snow was blown away, leaving icy corduroy. Tracks to the warming hut were poor – mostly snow filled by the wind. West of that hut, conditions were variable – a few blown in tracks in open areas, but mostly decent tracks in the more sheltered sections. Meadowview and Banff were both pleasant to ski on the west end. Returning to the daylodge from the warming hut area was exhausting – virtually no tracks and a strong headwind. The good news is that CNC has received 10-15cm new snow – things should be great with the next tracksetting and when it warms up a bit. Weather.com and TheWeatherNetwork both lied by promising it would be -8C in Canmore this morning! It was -17C! and windy at the parking lot, brrr! I met many other skiers on my way back and a trail runner. The latter was running out of the tracks (a good runner! ), must be hard running in deep snow. Then the other two runners and I had to ask them not to run in the tracks, for that’s what they’d been doing. Them more skiers, snowshoers, and fat bike riders. Great day there today, true winter! Great to meet you Nick and to have you racing on your Birkie-fast skis to break trail just ahead of us. My friend, Darcy broke trail to Spray River until we met one lady from Banff coming our direction just before the bridge. The next section got busier with skiers and temps stayed at -15 on my thermometer but NO wind. It had been so fierce @ 09:30 am atop of Goat Creek I could barely get the car door open!!!! But as soon as we skied down that first hill, it was absolutely glorious. Moral of the story: never judge Goat Creek trail by its adverse conditions in the parking lot. We did stop at the wooden shelter for a quick bite, and were reunited with some wind and increasing snow on our last section on Banff West Spray. ( I measured 11 cms on top of Goat Creek bridge.) My vintage green -10 to -15 worked well superbly. Am glad we started as early as we did, as storm did appear to increase in intensity @ 1pm when approaching Banff. Indeed a lots f fresh powder (20-30cm) on all the trails. We skied Ribbon creek, broke trail on Kovach and part of Aspen and back to the Ribbon Creek parking lot through Terrace. It was quite cold (-19C) with a bit of wind and tramping in so much powder was very, very slow but it was good to be back on these trails. We were hoping to see tracker Jeff on the trails we skied but unfortunately (for us) he was working on Bill mine…. Lake Louise. Lots of new snow and still sifting down. Fairview groomed and with the amount of new snow very easy to glide on blue wax from last week. MaSid’s bench covered with snow and awaiting sunshine and a bit of maintenance. Moraine nicely trackset. Lower Tramline to train station skier set( by a fast woman skier and our group of 6, but reasonable glide. Temperature starting out was -5 and rapidly dropping to -12 with winds picking up. Glad to get off the trail when we did. Skied in to Shadow Lake January 31. Excellent conditions until the first campground about 6 km up the fire road. Then, where the trail narrows somewhat and the snow gets softer, some idiots on bikes had to get off and walk the rest of the way. They simply destroyed the trail, walking directly in the old ski tracks and making huge holes all the way to the lodge. This made skiing much more difficult and even with 3 of us skiing in and out, the trail was still nasty. Are bikes even allowed on tis trail? It is hard to know how to define a multi-purpose trail anymore, but for back/front-country lodges like Shadow Lake, Sundance Lodge, or even Lake O’Hara Lodge, it is likely hard enough to book some of these lodges, without restricting how their guests can access them? Their choices would be hiking/walking, snow-shoeing, x-c skiing, AT skiing or fat biking to them. Good to see you and Liz on skierbob, Tony. The Liberal Government, like the previous Conservative Government, is continuing logging operations in Banff National Park. They contend that it is for fire suppression purposes and that revenues earned will be pumped back into the Banff National Park. I would assume the revenues would be used again to log more. This is a “slippery slope” and should not be permitted. What is being cleared, a fire can easily jump. Fires can easily jump from one side of the valley to the other, so the government’s position on fire suppression is a joke. Embers from flames can travel up to 2 km in the wind and start fires elsewhere as what was demonstrated in Fort McMurray and in BC the last couple of summers.. In a real democracy, where people make decisions rather than just politicians, Canadians would have the right to determine if logging is permitted in National Parks for the benefit of corporations. What is the Legalization of Real Democracy? It is a movement to allow people to vote on bills before Legislative Assemblies and the House of Commons so that political power shifts from politicians to the people. Government with the people, for the people, by the people. I believe the purpose of the cut is to reduce the risk of a fast moving, up-slope fire on the west side of Sulphur Mt. Such a fire there would create a large plume of hot embers that could be carried by the prevailing west wind directly into the town of Banff. I understand the so called justification of Parks Canada to permit logging in National Parks- something that actually was stopped by former Prime Minister Mulroney. PM Harper reversed that. However, what Parks Canada are doing will not stop fires as everything for a couple of kilometers around the town would have to be clear cut. Large fires create their own winds and prevailing winds may or may not be an issue in a large fire. Furthermore, when forest systems are clear cut they cause local forests to dry out quicker as drying winds reach into the forests easier. Grasses replacing clear cuts are easier to start on fire than trees as well. Some of the biggest fires in Alberta have been grass fires and they often can not be easily stopped. Will we have the government mow down the grasses afterwards to reduce the fire hazard? Also, I have seen many replanted young clear cuts burn as well. Nothing stops fire expect moisture and rock. When the Parks are logged or control burned, there is no place left in Alberta for natural environments to occur. Species at risk like Woodland Caribou lose habitat along with other species. Our Parks are suppose to be about natural environments, not industrial extraction. The best fire suppression for the town of Banff is to have sprinkler systems installed on all roof tops and eliminate all wood building materials. Furthermore, sprinkler systems should be installed around the perimeters of the town. The town should not be permitted to expand building anymore as well. Installing sprinkler infrastructure is far safer and reduces fire fighting costs which saves tax dollars. The town of Banff and residents lack the will to install such sprinkler infrastructure. If they don’t want to install such smart proactive sprinkler infrastructure, then they should suffer the consequences in a fire and the tax payers should not bail them out after a fire with rebuilding costs. I would also assume that the logging companies profiting off of the logging in Banff are donation supporters of the Liberals and Conservatives which are the parties that support logging valuable wood in National Parks. Fire suppression is being used as a phoney excuse by our government to log in our National Parks so that corporations can profit at the expense of the natural environment. This is a bad slippery slope that is only going to expand if people do not resist. In a real legalized democracy, Canadians would have the opportunity to decide whether or not logging occurs in our National Parks. The Government talks about environmental balance but there is no such thing as the environment is being harmed everywhere including in our National Parks. Personally, I prefer not to see clear cuts in Banff when I cross country ski or hike as it takes away from the natural experience and it creates environmental harms. There are stump ridden clear cuts along Pipestone trail #20, in the Banff area, in the mid Spray River Valley and elsewhere in Banff National Park. It is time for clear cutting to be halted in our National Parks for the benefit of the natural environment and valuable tax saving flood control purposes. Lets not ski in a clear cut Park and lets allow natural system to occur in Banff. If we’re not going to allow logging, then we shouldn’t allow fire suppression either. A hundred years ago, the land around here was mostly grassland due to regular, naturally occurring wildfires. The “natural” experience of skiing through the forest that we all enjoy so much isn’t actually natural at all but a result of decades of fire suppression. We’ve put ourselves in a difficult position, but short of just letting everything burn, controlled burns, targeted logging and letting fires in unpopulated areas run are the only options available. If I had been given the chance to vote on the cutting that’s being done in order to reduce the chance of my town being destroyed by a wildfire, I would have voted “yes”. BTW, I live in Banff and have the sprinklers ready to go, just in case. Wonderful conditions on Goat Creek trail today. Thanks to Mikes trail report from January 30 we were prepared for the almost exposed rocks at the trailhead and the 1k or so of untracked trail until we reached the park boundary. There was enough fresh snow to cover the ice on the steeper downhills and to cover needles and cones as we neared Banff. A great ski! I would like to ski this trail today but not sure whether to start in canmore or banff? How do you get back to where you started? Is it possible to ski both ways? can Ski both ways but if you srart in Banff and go all the way, you will have an easier return.. probably will be a lot of snow on the trail today. Yes, it was a crazy weather day today! Left Calgary at – 13C this morning and drove into a tropical paradise! Okay slight exaggeration….. we did pass through some light rain at Fortress Junction, and the thermometer at PLPP Discovery Centre read just above zero at both 11 am and 3 pm. The slight amount of fresh snow was very sticky, and everyone was having trouble with icing, and yet we had a very enjoyable trip up Whiskey Jack and Lookout (North), and a fast and fun ski back down. WJ has not been groomed for a week, but skier tracks/ snowplows were good and smooth, with a few needles. Lookout was freshly groomed, and snowing with a huge windchill at the top. Brrrr! There was a bit more light rain here and there at lower elevations, and very suddenly a bit of snow on the road north of Galatea on the drive home. It was actually a good day to be out skiing at the south end of PLPP, and I have to add that we have skied successfully in the rain (not today), so don’t be completely discouraged unless it is a downpour! Skate skied Canmore today (Friday). Is it just me or is the Weather Network always messed up for Canmore? It was around -10 C with light snow when I arrived at 9 am but the Weather Network said 1 C and raining. The trails were in great shape out as far as the warming hut. I didn’t venture further than that. There was lots of activity getting ready for the biathlon races the weekend of Feb 9 – 10. I’m thinking I’ll go watch some races if it’s not ridiculously cold. I have found that the Weather Network is not the most reliable source of info. For me the most accurate weather temperature for the CNC is the Trail Sports website weather thermometer. An added bonus is that it shows the suggested colour of Swix grip wax for the temperature! Keep in mind that current snow temperature and texture will impact your wax selection. Of course skate skiing makes waxing so much simpler! Something different for this page, we’re in Fernie checking out the Nordic trails. Yesterday we skied up the Montane Trail to a warming hut and it was impressive to see how well trails are marked here. There are multi-use trails for fat biking and hiking, and then dedicated trails for skiing with red stop signs and bright green signage everywhere telling non skiers that they are on the wrong trail. No way to “accidentally” hike or bike onto a ski trail here. And with all the amazing multi use trails there’s no need to use the ski trails anyway without skis on. Today we took a snow cat tour up to Island Lake Lodge for lunch. The tour costs $75 for a ride up and down with lunch included. We chose to ski out though on the wonderfully groomed Cedar Trail. There was a ski loop around the lake as well which we tried, and there are Snowshoe rentals for non skiers. Great report Tanya. Nice to hear of well managed multi-use areas just outside those oft reported here. I’ve heard many great things happening there with the nordic community just in the last few years. At only 2.5hrs from yyc, sounds like a must visit! It’s truly amazing what they’ve created in Fernie! Today I skied at the official Nordic Centre where they have a snow cat for grooming!!! I regret not taking a photo for you Bob. I left my boys at the Fernie Alpine Resort and skied down to the Nordic centre from there. They groom a connector trail so you can access the Nordic trails from the resort. Nice kiosk too with info on how to pay Trail fees as soon as you reach the official boundary of the Nordic centre. The key thing to note about the BC XC ski destinations is that they have user fees. When users pay a fee, they also expect a standard of service. When an operation depends on customers for funding, then they make sure the quality of the service will keep those customers coming back. Very true Alf. I appreciate our free skiing a lot in Alberta!! Shark Mountain: 10:00 am, minus 1C at the parking lot with about 5 cm new snow over recent grooming. Waxes used (VR45 and VR50) didn’t work well in the new snow and warm temperature. Those with waxless fish scale fared better. After scraping off some VR50, the skiing was better. Went on Watridge Lake road to the Spray River – the hill has now been well ploughed! Returning, the skier set tracks were quick on the downhills. Lots of skiers and quite a few dogs enjoyed a beautiful warm winter day. Leaving Shark it was still snowing lightly, the temp was 0C – Canmore was minus 12C! I skied from the Nakiska Lodge up to where High Level trail branches off. It was a bit icy at the bottom though the light snow falling made it less so when I came back down. The higher parts of the trail had decent amounts of snow but hadn’t been groomed recently. Nobody has skied Sunburst or High Level trails recently. Ribbon: Today I decided to get a Xski in before the cold sets in for the next few days. Planned destination was Pocaterra, and if the conditions were not going to be ideal, then we would move on to Elk Pass. As we’re driving down the 40 and passing the Grizzly Creek sign, much to our surprise it starts Raining. We continue on our merry way and reach Pocaterra and it’s still Raining, we then start heading down the road towards Elk Pass, however it’s still Raining. We decided to turn around and head back home but as we’re about to pass the Kananaskis Village turnoff, I get anidea, “let’s try Ribbon”. Eventhough it was trackset, it wasn’t the greatest place today to xski. The area needs alot of new snow. In areas the snow was very thin, lots of pine needles/cones. Sometimes you see the tracks sometimes you don’t since there isn’t enough snow. Lots of icey conditions. I’ll for sure come back, but only once they get loads and loads of new snow. Decided to enjoy the freshly groomed tracks at Mt Shark. Took it easy and just went to the bridge and the end of the Spray Lakes and back again. Temperature was +4, and snow temperature was -1, so V40 seemed to do the trick. From what we could tell, the Live Grooming Report is accurate. The winds were pretty high, so there’s debris in the tracks – it’s not brutal, but I did have to stop a couple of times to pull moss off my skis. Icing was also a bit of an issue, but all in all it was a great day. The trails are in really good shape, and the descent to the bridge was easily controlled.